Structures or portions of structures shall be classified with respect to occupancy in one or more of the groups in accordance with Table R300.1. Buildings and structures, and all parts thereof, shall be constructed to safely support all loads, including dead loads, live loads, roof loads, flood loads, snow loads, wind loads and seismic loads as prescribed by this code. The construction of buildings and structures in accordance with the provisions of this code shall result in a system that provides a complete load path that meets all requirements for the transfer of all loads from their point of origin through the load-resisting elements to the foundation. Buildings and structures constructed as prescribed by this code are deemed to comply with the requirements of this section. As an alternative to the requirements in Section R301.1 the following standards are permitted subject to the limitations of this code and the limitations therein. Where engineered design is used in conjunction with these standards, the design shall comply with the International Building Code. 1.AF&PA Wood Frame Construction Manual (WFCM). 2.AISI Standard for Cold-Formed Steel Framing—Prescriptive Method for One- and Two-Family Dwellings (AISI S230). 3.ICC Standard on the Design and Construction of Log Structures (ICC 400). The requirements of this code are based on platform and balloon-frame construction for light-frame buildings. The requirements for concrete and masonry buildings are based on a balloon framing system. Other framing systems must have equivalent detailing to ensure force transfer, continuity and compatible deformations. When a building of otherwise conventional construction contains structural elements exceeding the limits of Section R301 or otherwise not conforming to this code, these elements shall be designed in accordance with accepted engineering practice. The extent of such design need only demonstrate compliance of nonconventional elements with other applicable provisions and shall be compatible with the performance of the conventional framed system. Engineered design in accordance with the International Building Code is permitted for all buildings and structures, and parts thereof, included in the scope of this code. R301.2Climatic and geographic design criteria. Buildings shall be constructed in accordance with the provisions of this code as limited by the provisions of this section. Additional criteria shall be established by the local jurisdiction and set forth in Table R301.2(1). For SI: 1 pound per square foot = 0.0479 kPa, 1 mile per hour = 0.447 m/s. a.Weathering may require a higher strength concrete or grade of masonry than necessary to satisfy the structural requirements of this code. 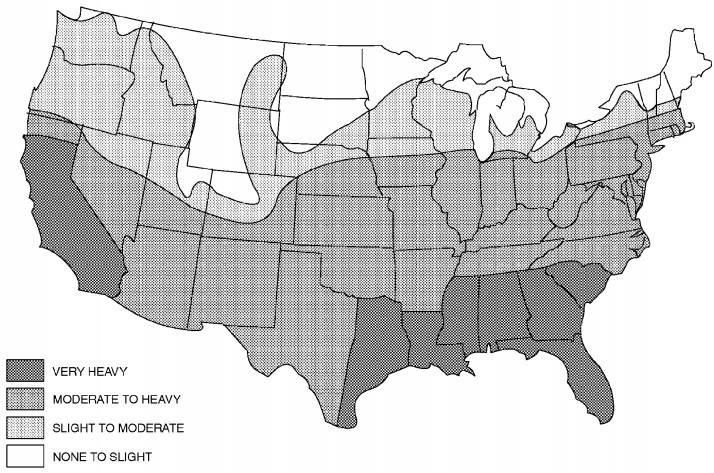 The weathering column shall be filled in with the weathering index, such as “negligible,” “moderate,” or “severe,” for concrete as determined from the Weathering Probability Map [Figure R301.2(3)]. The grade of masonry units shall be determined from ASTM C 34, C 55, C 62, C 73, C 90, C 129, C 145, C 216, or C 652.
b.See Minnesota Rules, part 1303.1600 – Footing Depth for Frost Protection to verify whether the county requires Zone I or Zone II frost protection. c.The jurisdiction shall fill in this part of the table to indicate the need for protection depending on whether there has been a history of local subterranean termite damage. 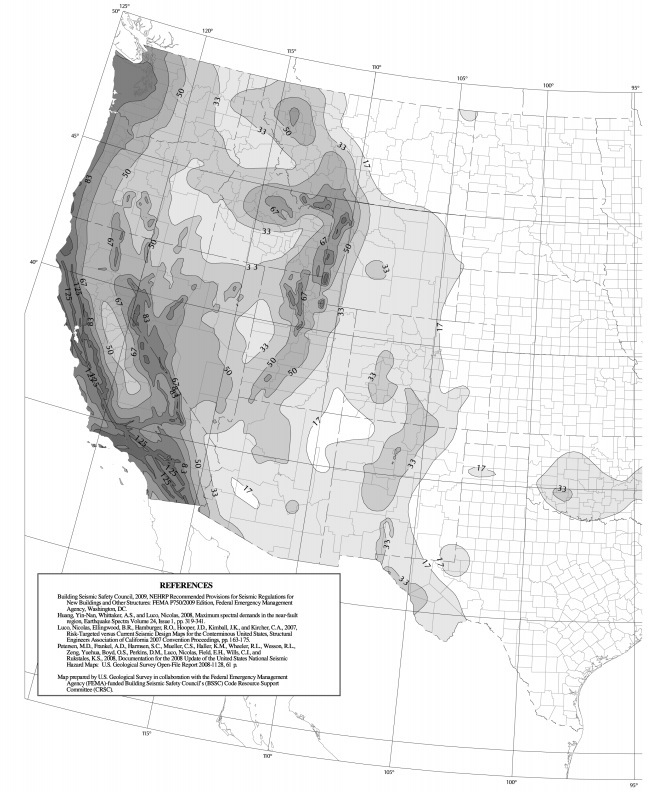 d.The jurisdiction shall fill in this part of the table with the wind speed from the basic wind speed map [Figure R301.2(4)A]. Wind exposure category shall be determined on a site-specific basis in accordance with Section R301.2.1.4. e.See Minnesota Rules, Chapter 1322 - Table R403.5.17 Climate Data Design Conditions to verify by city. f.The ground snow loads to be used in determining the design snow loads for buildings and other structures are given in Minnesota Rules, part 1303.1700 - Ground Snow Load to verify by county. The roof snow load is a uniform load on the horizontal projection of the roof. g.See Minnesota Rules, Chapter 1335, Flood Proofing Regulations. h.In accordance with Sections R905.2.7.1, R905.4.3.1, R905.5.3.1, R905.6.3.1, R905.7.3.1, and R905.8.3.1, where there has been a history of local damage from the effects of ice damming. i.The jurisdiction shall fill in this part of the table with the 100-year return period air freezing index (BF-days) from Figure R403.3(2) or from the 100-year (99 percent) value on the National Climatic Data Center data table “Air Freezing Index-USA Method (Base 32°F)” at www.ncdc.noaa.gov/oa/fpsf. 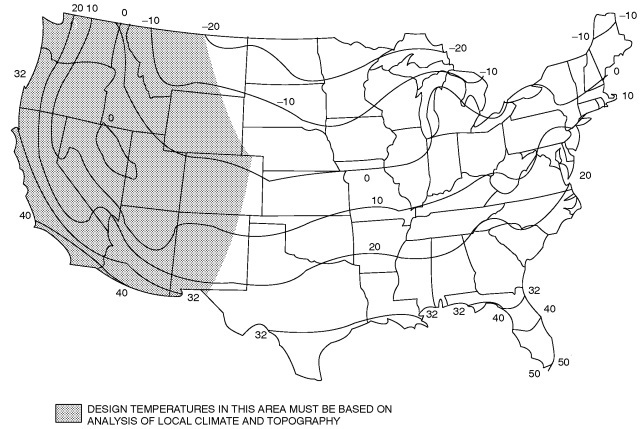 j.The jurisdiction shall fill in this part of the table with the mean annual temperature from the National Climatic Data Center data table “Average Mean Temperature Index” at http://www.esrl.noaa.gov/psd/data/usclimate/tmp.state.19712000.climo. k.In accordance with Section R301.2.1.5. 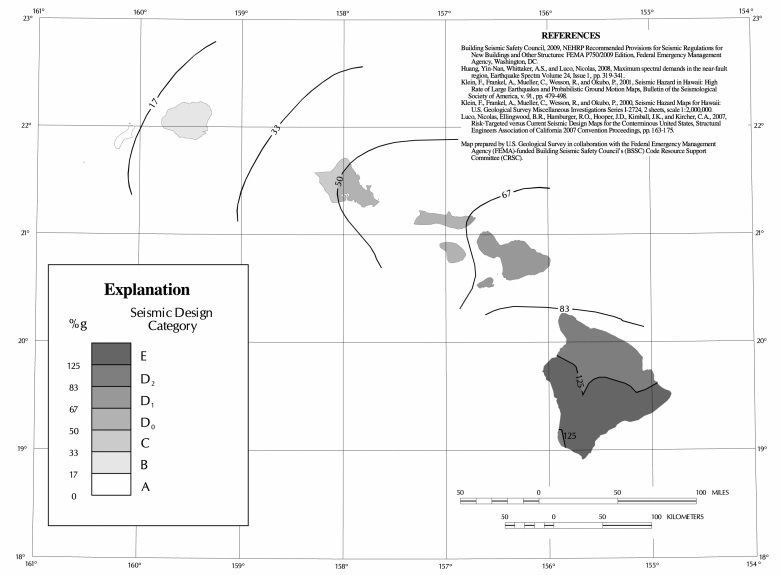 l.Assigned to allow the application of the least restrictive topographic provisions of the code. For SI: 1 foot = 304.8 mm, 1 square foot = 0.0929 m2, 1 mile per hour = 0.447 m/s, 1 pound per square foot = 0.0479 kPa. a.The effective wind area shall be equal to the span length multiplied by an effective width. This width shall be permitted to be not be less than one-third the span length. For cladding fasteners, the effective wind area shall not be greater than the area that is tributary to an individual fastener. b.For effective areas between those given above, the load may be interpolated; otherwise, use the load associated with the lower effective area. c.Table values shall be adjusted for height and exposure by multiplying by the adjustment coefficient in Table R301.2(3). d.See Figure R301.2(7) for location of zones. e.Plus and minus signs signify pressures acting toward and away from the building surfaces. 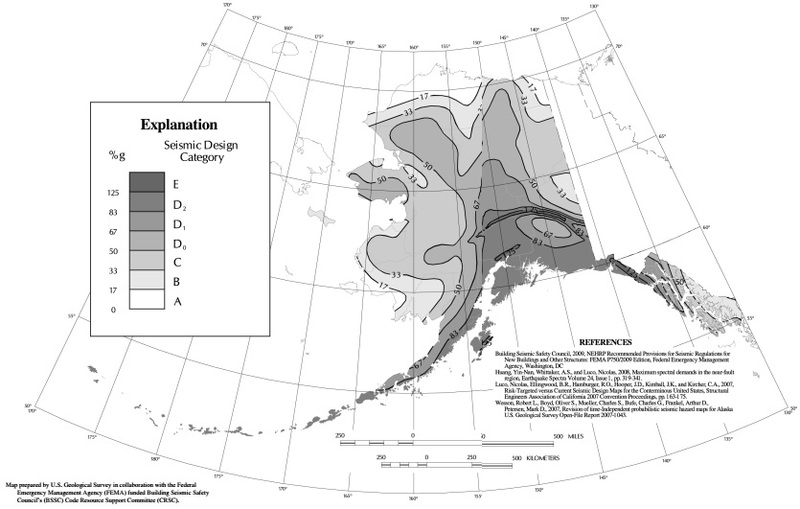 a.Alaska and Hawaii are classified as severe and negligible, respectively. b.Lines defining areas are approximate only. 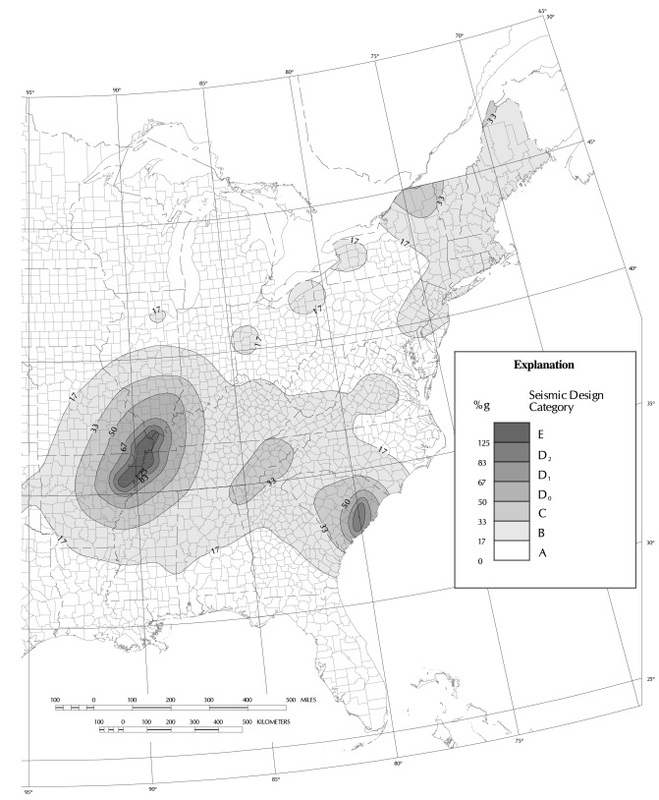 Local conditions may be more or less severe than indicated by region classification. A severe classification is where weather conditions result in significant snowfall combined with extended periods during which there is little or no natural thawing causing deicing salts to be used extensively. Note: Lines defining areas are approximate only. Local conditions may be more or less severe than indicated by the region classification. For SI: 1 foot = 304.8 mm, 1 degree = 0.0175 rad. Note: a = 4 feet in all cases. Buildings and portions thereof shall be constructed in accordance with the wind provisions of this code using the basic wind speed in Table R301.2(1) as determined from Figure R301.2(4)A. The structural provisions of this code for wind loads are not permitted where wind design is required as specified in Section R301.2.1.1. Where different construction methods and structural materials are used for various portions of a building, the applicable requirements of this section for each portion shall apply. Where not otherwise specified, the wind loads listed in Table R301.2(2) adjusted for height and exposure using Table R301.2(3) shall be used to determine design load performance requirements for wall coverings, curtain walls, roof coverings, exterior windows, skylights, garage doors and exterior doors. Asphalt shingles shall be designed for wind speeds in accordance with Section R905.2.4. A continuous load path shall be provided to transmit the applicable uplift forces in Section R802.11.1 from the roof assembly to the foundation. R301.2.1.1Wind limitations and wind design required. The wind provisions of this code shall not apply to the design of buildings where wind design is required in accordance with Figure R301.2(4)B or where the basic wind speed from Figure R301.2(4)A equals or exceeds 110 miles per hour (49 m/s). 1.For concrete construction, the wind provisions of this code shall apply in accordance with the limitations of Sections R404 and R611. 2.For structural insulated panels, the wind provisions of this code shall apply in accordance with the limitations of Section R613. The elements of design not addressed by the methods in Items 1 through 5 shall be in accordance with the provisions of this code. 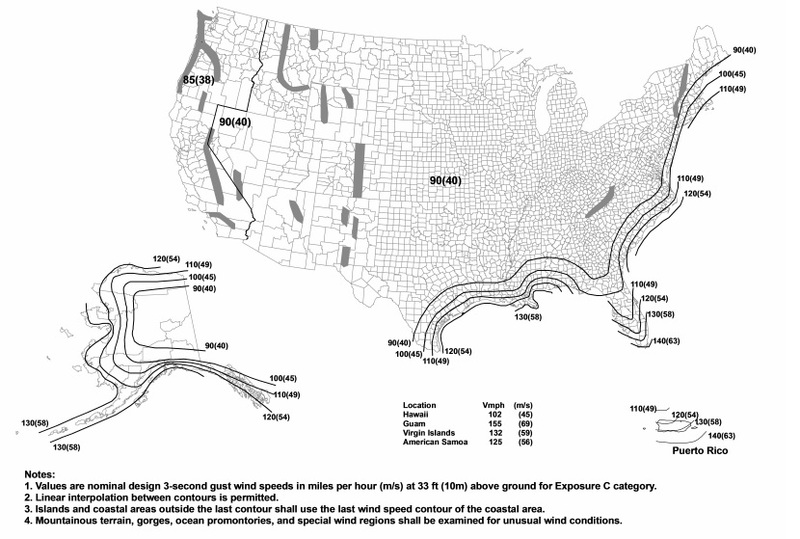 When ASCE 7 or the International Building Code is used for the design of the building, the wind speed map and exposure category requirements as specified in ASCE 7 and the International Building Code shall be used. Exterior glazing in buildings located in windborne debris regions shall be protected from windborne debris. Glazed opening protection for windborne debris shall meet the requirements of the Large Missile Test of ASTM E 1996 and ASTM E 1886 referenced therein. 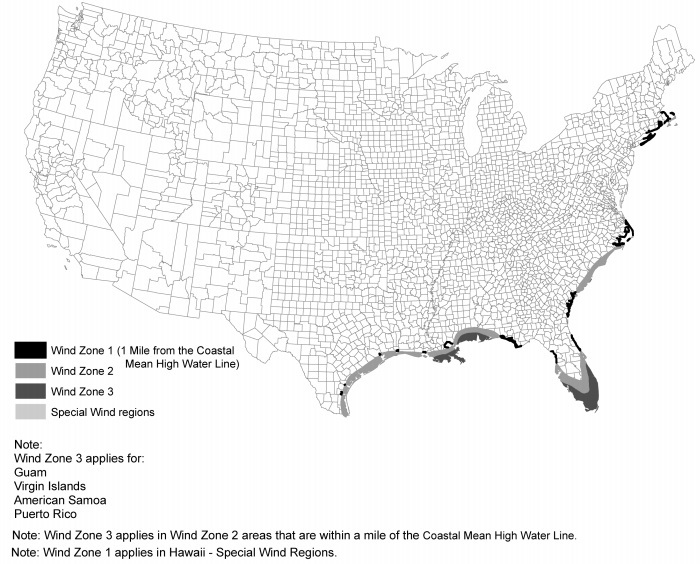 The applicable wind zones for establishing misile types in ASTM E 1996 are shown on Figure R301.2(4)C. Garage door glazed opening protection for windborne debris shall meet the requirements of an approved impact-resisting standard or ANSI/DASMA 115. Exception: Wood structural panels with a minimum thickness of 7/16 inch (11 mm) and a maximum span of 8 feet (2438 mm) shall be permitted for opening protection in one- and two-story buildings. Panels shall be precut and attached to the framing surrounding the opening containing the product with the glazed opening. Panels shall be predrilled as required for the anchorage method and shall be secured with the attachment hardware provided. Attachments shall be designed to resist the component and cladding loads determined in accordance with either Table R301.2(2) or ASCE 7, with the permanent corrosion-resistant attachment hardware provided and anchors permanently installed on the building. Attachment in accordance with Table R301.2.1.2 is permitted for buildings with a mean roof height of 33 feet (10 058 mm) or less where located in Wind Zones 1 and 2 in accordance with Figure R301.2(4)C.
For SI: 1 inch = 25.4 mm, 1 foot = 304.8 mm, 1 pound = 4.448 N, 1 mile per hour = 0.447 m/s. a.This table is based on 130 mph wind speeds and a 33-foot mean roof height. b.Fasteners shall be installed at opposing ends of the wood structural panel. Fasteners shall be located a minimum of 1 inch from the edge of the panel. c.Anchors shall penetrate through the exterior wall covering with an embedment length of 2 inches minimum into the building frame. Fasteners shall be located a minimum of 21/2 inches from the edge of concrete block or concrete. d.Where panels are attached to masonry or masonry/stucco, they shall be attached using vibration-resistant anchors having a minimum ultimate withdrawal capacity of 1500 pounds. When referenced documents are based on fastest mile wind speeds, the three-second gust basic wind speeds, V3s, of Figure R301.2(4) shall be converted to fastest mile wind speeds, Vfm, using Table R301.2.1.3. For SI: 1 mile per hour = 0.447 m/s. 1.Exposure A. Large city centers with at least 50 percent of the buildings having a height in excess of 70 feet (21 336 mm). Use of this exposure category shall be limited to those areas for which terrain representative of Exposure A prevails in the upwind direction for a distance of at least 0.5 mile (0.8 km) or 10 times the height of the building or other structure, whichever is greater. Possible channeling effects or increased velocity pressures due to the building or structure being located in the wake of adjacent buildings shall be taken into account. 2.Exposure B. 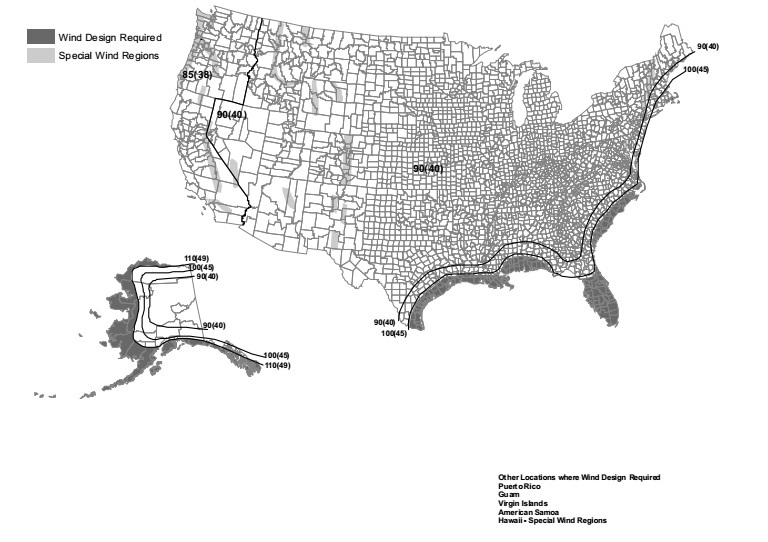 Urban and suburban areas, wooded areas, or other terrain with numerous closely spaced obstructions having the size of single-family dwellings or larger. Exposure B shall be assumed unless the site meets the definition of another type exposure. 3.Exposure C. Open terrain with scattered obstructions, including surface undulations or other irregularities, having heights generally less than 30 feet (9144 mm) extending more than 1,500 feet (457 m) from the building site in any quadrant. This exposure shall also apply to any building located within Exposure B type terrain where the building is directly adjacent to open areas of Exposure C type terrain in any quadrant for a distance of more than 600 feet (183 m). This category includes flat, open country and grasslands. 4.Exposure D. Flat, unobstructed areas exposed to wind flowing over open water for a distance of at least 1 mile (1.61 km). Shorelines in Exposure D include inland waterways, the Great Lakes, and coastal areas of California, Oregon, Washington and Alaska. This exposure shall apply only to those buildings and other structures exposed to the wind coming from over the water. Exposure D extends inland from the shoreline a distance of 1500 feet (457 m) or 10 times the height of the building or structure, whichever is greater. 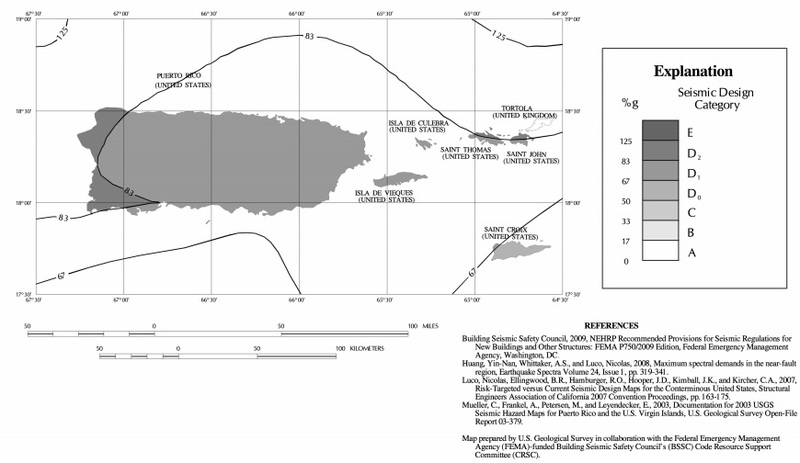 In areas designated in Table R301.2(1) as having local historical data documenting structural damage to buildings caused by wind speed-up at isolated hills, ridges and escarpments that are abrupt changes from the general topography of the area, topographic wind effects shall be considered in the design of the building in accordance with Section R301.2.1.5.1 or in accordance with the provisions of ASCE 7. See Figure R301.2.1.5.1(1) for topographic features for wind speed-up effect. 1.The average slope of the top half of the hill, ridge or escarpment is 10 percent or greater. 2.The hill, ridge or escarpment is 60 feet (18 288 mm) or greater in height for Exposure B, 30 feet (9144 mm) or greater in height for Exposure C, and 15 feet (4572 mm) or greater in height for Exposure D.
3.The hill, ridge or escarpment is isolated or unobstructed by other topographic features of similar height in the upwind direction for a distance measured from its high point of 100 times its height or 2 miles, whichever is less. See Figure R301.2.1.5.1(3) for upwind obstruction. 4.The hill, ridge or escarpment protrudes by a factor of two or more above the height of other upwind topographic features located in any quadrant within a radius of 2 miles measured from its high point. R301.2.1.5.1Simplified topographic wind speed-up method. As an alternative to the ASCE 7 topographic wind provisions, the provisions of Section R301.2.1.5.1 shall be permitted to be used to design for wind speed-up effects, where required by Section R301.2.1.5. Structures located on the top half of isolated hills, ridges or escarpments meeting the conditions of Section R301.2.1.5 shall be designed for an increased basic wind speed as determined by Table R301.2.1.5.1. On the high side of an escarpment, the increased basic wind speed shall extend horizontally downwind from the edge of the escarpment 1.5 times the horizontal length of the upwind slope (1.5L) or 6 times the height of the escarpment (6H), whichever is greater. See Figure R301.2.1.5.1(2) for where wind speed increase is applied. Note: H/2 determines the measurement point for Lh. L is twice Lh. 1.Townhouses in Seismic Design Categories C, D0, D1 and D2. 2.Detached one- and two-family dwellings in Seismic Design Categories, D0, D1 and D2. R301.2.2.1Determination of seismic design category. Buildings shall be assigned a seismic design category in accordance with Figure R301.2(2). R301.2.2.1.1Alternate determination of seismic design category. The seismic design categories and corresponding short period design spectral response accelerations, SDS shown in Figure R301.2(2) are based on soil Site Class D, as defined in Section 1613.5.2 of the International Building Code. If soil conditions are other than Site Class D, the short period design spectral response accelerations, SDS, for a site can be determined according to Section 1613.5 of the International Building Code. The value of SDS determined according to Section 1613.5 of the International Building Code is permitted to be used to set the seismic design category according to Table R301.2.2.1.1, and to interpolate between values in Tables R602.10.1.2(2), R603.9.2(1) and other seismic design requirements of this code. R301.2.2.1.2Alternative determination of Seismic Design Category E.
1.A more detailed evaluation of the seismic design category is made in accordance with the provisions and maps of the International Building Code. Buildings located in Seismic Design Category E per Table R301.2.2.1.1, but located in Seismic Design Category D per the International Building Code, may be designed using the Seismic Design Category D2 requirements of this code. 2.1.All exterior shear wall lines or braced wall panels are in one plane vertically from the foundation to the uppermost story. 2.2.Floors shall not cantilever past the exterior walls. 2.3.The building is within all of the requirements of Section R301.2.2.2.5 for being considered as regular. Structures assigned to Seismic Design Category C shall conform to the requirements of this section. 1.Fifteen pounds per square foot (720 Pa) for exterior light-frame wood walls. 2.Fourteen pounds per square foot (670 Pa) for exterior light-frame cold-formed steel walls. 3.Ten pounds per square foot (480 Pa) for interior light-frame wood walls. 4.Five pounds per square foot (240 Pa) for interior light-frame cold-formed steel walls. 5.Eighty pounds per square foot (3830 Pa) for 8-inch-thick (203 mm) masonry walls. 6.Eighty-five pounds per square foot (4070 Pa) for 6-inch-thick (152 mm) concrete walls. 7.Ten pounds per square foot (480 Pa) for SIP walls. 1.Roof and ceiling dead loads not exceeding 25 pounds per square foot (1190 Pa) shall be permitted provided the wall bracing amounts in Chapter 6 are increased in accordance with Table R301.2.2.2.1. 2.Light-frame walls with stone or masonry veneer shall be permitted in accordance with the provisions of Sections R702.1 and R703. 3.Fireplaces and chimneys shall be permitted in accordance with Chapter 10. For SI: 1 pound per square foot = 0.0479 kPa. a.Linear interpolation shall be permitted. Anchored stone and masonry veneer shall comply with the requirements of Sections R702.1 and R703. Masonry construction shall comply with the requirements of Section R606.12. Detached one- and two-family dwellings with exterior above-grade concrete walls shall comply with the requirements of Section R611, PCA 100 or shall be designed in accordance with ACI 318. Townhouses with above-grade exterior concrete walls shall comply with the requirements of PCA 100 or shall be designed in accordance with ACI 318. 1.When exterior shear wall lines or braced wall panels are not in one plane vertically from the foundation to the uppermost story in which they are required. 1.Floor joists are nominal 2 inches by 10 inches (51 mm by 254 mm) or larger and spaced not more than 16 inches (406 mm) on center. 2.The ratio of the back span to the cantilever is at least 2 to 1. 3.Floor joists at ends of braced wall panels are doubled. 5.Gravity loads carried at the end of cantilevered joists are limited to uniform wall and roof loads and the reactions from headers having a span of 8 feet (2438 mm) or less. 2.When a section of floor or roof is not laterally supported by shear walls or braced wall lines on all edges. Exception: Portions of floors that do not support shear walls or braced wall panels above, or roofs, shall be permitted to extend no more than 6 feet (1829 mm) beyond a shear wall or braced wall line. 3.When the end of a braced wall panel occurs over an opening in the wall below and ends at a horizontal distance greater than 1 foot (305 mm) from the edge of the opening. This provision is applicable to shear walls and braced wall panels offset in plane and to braced wall panels offset out of plane as permitted by the exception to Item 1 above. 5.The entire length of the braced wall panel does not occur over an opening in the wall below. 4.When an opening in a floor or roof exceeds the lesser of 12 feet (3658 mm) or 50 percent of the least floor or roof dimension. 5.When portions of a floor level are vertically offset. 1.Framing supported directly by continuous foundations at the perimeter of the building. 2.For wood light-frame construction, floors shall be permitted to be vertically offset when the floor framing is lapped or tied together as required by Section R502.6.1. 6.When shear walls and braced wall lines do not occur in two perpendicular directions. 7.When stories above grade plane partially or completely braced by wood wall framing in accordance with Section R602 or steel wall framing in accordance with Section R603 include masonry or concrete construction. Exception: Fireplaces, chimneys and masonry veneer as permitted by this code. When this irregularity applies, the entire story shall be designed in accordance with accepted engineering practice. R301.2.2.3Seismic Design Categories D0, D1 and D2. Structures assigned to Seismic Design Categories D0, D1 and D2 shall conform to the requirements for Seismic Design Category C and the additional requirements of this section. Wood-framed buildings shall be limited to three stories above grade plane or the limits given in Table R602.10.3(3). Cold-formed, steel-framed buildings shall be limited to less than or equal to three stories above grade plane in accordance with AISI S230. Mezzanines as defined in Section R202 shall not be considered as stories. Structural insulated panel buildings shall be limited to two stories above grade plane. Masonry construction in Seismic Design Categories D0 and D1 shall comply with the requirements of Section R606.12.1. Masonry construction in Seismic Design Category D2 shall comply with the requirements of Section R606.12.4. Buildings with exterior above-grade concrete walls shall comply with PCA 100 or shall be designed in accordance with ACI 318. R301.2.2.3.5Cold-formed steel framing in Seismic Design Categories D0, D1 and D2. In Seismic Design Categories D0, D1 and D2 in addition to the requirements of this code, cold-formed steel framing shall comply with the requirements of AISI S230. Masonry chimneys shall be reinforced and anchored to the building in accordance with Sections R1003.3 and R1003.4. Water heaters shall be anchored against movement and overturning in accordance with Section M1307.2. Buildings in Seismic Design Category E shall be designed to resist seismic loads in accordance with the International Building Code, except when the seismic design category is reclassified to a lower seismic design category in accordance with Section R301.2.2.1. Components of buildings not required to be designed to resist seismic loads shall be constructed in accordance with the provisions of this code. Wood-framed construction, cold-formed, steel-framed construction and masonry and concrete construction, and structural insulated panel construction in regions with ground snow loads 70 pounds per square foot (3.35 kPa) or less, shall be in accordance with Chapters 5, 6 and 8. Buildings in regions with ground snow loads greater than 70 pounds per square foot (3.35 kPa) shall be designed in accordance with accepted engineering practice. 1.For wood wall framing, the laterally unsupported bearing wall stud height permitted by Table R602.3(5) plus a height of floor framing not to exceed 16 inches (406 mm). Exception: For wood-framed wall buildings with bracing in accordance with Tables R602.10.3(1) and R602.10.3(3), the wall stud clear height used to determine the maximum permitted story height may be increased to 12 feet (3658 mm) without requiring an engineered design for the building wind and seismic force-resisting systems provided that the length of bracing required by Table R602.10.3(1) is increased by multiplying by a factor of 1.10 and the length of bracing required by Table R602.10.3(3) is increased by multiplying by a factor of 1.20. Wall studs are still subject to the requirements of this section. 2.For steel wall framing, a stud height of 10 feet (3048 mm), plus a height of floor framing not to exceed 16 inches (406 mm). 3.For masonry walls, a maximum bearing wall clear height of 12 feet (3658 mm) plus a height of floor framing not to exceed 16 inches (406 mm). Exception: An additional 8 feet (2438 mm) is permitted for gable end walls. 4.For insulating concrete form walls, the maximum bearing wall height per story as permitted by Section R611 tables plus a height of floor framing not to exceed 16 inches (406 mm). 5.For structural insulated panel (SIP) walls, the maximum bearing wall height per story as permitted by Section R613 tables shall not exceed 10 feet (3048 mm) plus a height of floor framing not to exceed 16 inches (406 mm). Individual walls or walls studs shall be permitted to exceed these limits as permitted by Chapter 6 provisions, provided story heights are not exceeded. Floor framing height shall be permitted to exceed these limits provided the story height does not exceed 11 feet 7 inches (3531 mm). An engineered design shall be provided for the wall or wall framing members when they exceed the limits of Chapter 6. Where the story height limits of this section are exceeded, the design of the building, or the noncompliant portions thereof, to resist wind and seismic loads shall be in accordance with the International Building Code. The actual weights of materials and construction shall be used for determining dead load with consideration for the dead load of fixed service equipment. The minimum uniformly distributed live load shall be as provided in Table R301.5. For SI: 1 pound per square foot = 0.0479 kPa, 1 square inch = 645 mm2, 1 pound = 4.45 N.
a.Elevated garage floors shall be capable of supporting a 2,000-pound load applied over a 20-square-inch area. b.Uninhabitable attics without storage are those where the maximum clear height between joists and rafters is less than 42 inches, or where there are not two or more adjacent trusses with web configurations capable of accommodating an assumed rectangle 42 inches high by 24 inches in width, or greater, within the plane of the trusses. This live load need not be assumed to act concurrently with any other live load requirements. c.Individual stair treads shall be designed for the uniformly distributed live load or a 300-pound concentrated load acting over an area of 4 square inches, whichever produces the greater stresses. d.A single concentrated load applied in any direction at any point along the top. e.See Section R502.2.2 for decks attached to exterior walls. f.Guard in-fill components (all those except the handrail), balusters and panel fillers shall be designed to withstand a horizontally applied normal load of 50 pounds on an area equal to 1 square foot. This load need not be assumed to act concurrently with any other live load requirement. g.Uninhabitable attics with limited storage are those where the maximum clear height between joists and rafters is 42 inches or greater, or where there are two or more adjacent trusses with web configurations capable of accommodating an assumed rectangle 42 inches in height by 24 inches in width, or greater, within the plane of the trusses. 1.The attic area is accessible from an opening not less than 20 inches in width by 30 inches in length that is located where the clear height in the attic is a minimum of 30 inches. 2.The slopes of the joists or truss bottom chords are no greater than 2 inches vertical to 12 units horizontal. 3.Required insulation depth is less than the joist or truss bottom chord member depth. The remaining portions of the joists or truss bottom chords shall be designed for a uniformly distributed concurrent live load of not less than 10 lb/ft2. h.Glazing used in handrail assemblies and guards shall be designed with a safety factor of 4. The safety factor shall be applied to each of the concentrated loads applied to the top of the rail, and to the load on the in-fill components. These loads shall be determined independent of one another, and loads are assumed not to occur with any other live load. The roof shall be designed for the live load indicated in Table R301.6 or the snow load indicated in Table R301.2(1), whichever is greater. For SI: 1 square foot = 0.0929 m2, 1 pound per square foot = 0.0479 kPa, 1 inch per foot = 83.3 mm/m. The allowable deflection of any structural member under the live load listed in Sections R301.5 and R301.6 or wind loads determined by Section R301.2.1 shall not exceed the values in Table R301.7. Note: L = span length, H = span height. a. The wind load shall be permitted to be taken as 0.7 times the Component and Cladding loads for the purpose of the determining deflection limits herein. b For cantilever members, L shall be taken as twice the length of the cantilever. c. For aluminum structural members or panels used in roofs or walls of sunroom additions or patio covers, not supporting edge of glass or sandwich panels, the total load deflection shall not exceed L/60. For continuous aluminum structural members supporting edge of glass, the total load deflection shall not exceed L/175 for each glass lite or L/60 for the entire length of the member, whichever is more stringent. For sandwich panels used in roofs or walls of sunroom additions or patio covers, the total load deflection shall not exceed L/120. d.Deflection for exterior walls with interior gypsum board finish shall be limited to an allowable deflection of H/180. For the purposes of this code, where dimensions of lumber are specified, they shall be deemed to be nominal dimensions unless specifically designated as actual dimensions. Construction, projections, openings and penetrations of exterior walls of dwellings and accessory buildings shall comply with Table R302.1(1); or dwellings equipped throughout with an automatic sprinkler system installed in accordance with Section P2904 shall comply with Table R302.1(2). 1.Walls, projections, openings or penetrations in walls perpendicular to the line used to determine the fire separation distance. 2.Walls of dwellings and accessory structures located on the same lot. 3.Detached tool sheds and storage sheds, playhouses and similar structures exempted from permits are not required to provide wall protection based on location on the lot. Projections beyond the exterior wall shall not extend over the lot line. 4.Detached garages accessory to a dwelling located within 2 feet (610 mm) of a lot line are permitted to have roof eave projections not exceeding 4 inches (102 mm). 5.Foundation vents installed in compliance with this code are permitted. a.1-hour on the underside equates to one layer of 5/8-inch type X gypsum sheathing. Openings are not allowed. Each townhouse shall be considered a separate building and shall be separated by fire-resistance-rated wall assemblies meeting the requirements of Section R302.1 for exterior walls. Exception: A common 1-hour fire-resistance-rated wall assembly tested in accordance with ASTM E 119 or UL 263 is permitted for townhouses if such walls do not contain plumbing or mechanical equipment, ducts or vents in the cavity of the common wall. The wall shall be rated for fire exposure from both sides and shall extend to and be tight against exterior walls and the underside of the roof sheathing. Electrical installations shall be installed in accordance with Minnesota Rules, Chapter 1315. Penetrations of electrical outlet boxes shall be in accordance with Section R302.4. The fire-resistance-rated wall assembly separating townhouses shall be continuous from the foundation to the underside of the roof sheathing, roof deck, or roof slab. The fire-resistance rating shall extend the full length of the wall or assembly, including wall extensions through and separating attached enclosed accessory structures. The separation shall extend through enclosed soffits, overhangs, and similar projections. 2.Where roof surfaces adjacent to the wall or walls are at different elevations, and the higher roof is not more than 30 inches (762 mm) above the lower roof, the parapet shall extend not less than 30 inches (762 mm) above the lower roof surface. Exception: A parapet is not required in the two cases above when the roof is covered with a minimum class C roof covering, and the roof decking or sheathing is of noncombustible materials or approved fire-retardant-treated wood for a distance of 4 feet (1219 mm) on each side of the wall or walls, or one layer of 5/8-inch (15.9 mm) type X gypsum board is installed directly beneath the roof decking or sheathing, supported by a minimum of nominal 2-inch (51 mm) ledgers attached to the sides of the roof framing members, for a minimum distance of 4 feet (1219 mm) on each side of the wall or walls and there are no openings or penetrations in the roof within 4 feet (1219 mm) of the common walls. 3.A parapet is not required where roof surfaces adjacent to the wall or walls are at different elevations and the higher roof is more than 30 inches (762 mm) above the lower roof. The common wall construction from the lower roof to the underside of the higher roof deck shall have not less than a 1-hour fire-resistance rating. The wall shall be rated for exposure from both sides. Parapets shall have the same fire-resistance rating as that required for the supporting wall or walls. On any side adjacent to a roof surface, the parapet shall have noncombustible faces for the uppermost 18 inches (457 mm), to include counterflashing and coping materials. Where the roof slopes toward a parapet at slopes greater than 2 units vertical in 12 units horizontal (16.7 percent slope), the parapet shall extend to the same height as any portion of the roof within a distance of 3 feet (914 mm), but in no case shall the height be less than 30 inches (762 mm). Each individual townhouse shall be structurally independent. 1.Foundations supporting exterior walls or common walls. 2.Structural roof and wall sheathing from each unit may fasten to the common wall framing. 3.Nonstructural wall and roof coverings. 4.Flashing at termination of roof covering over common wall. 5.Townhouses separated by a common 1-hour fire-resistance-rated wall as provided in Section R302.2. Townhouses constructed in accordance with Section R302.2 shall comply with the sound transmission requirements of Appendix K.
Dwelling units in two-family dwellings shall be separated from each other by wall and/or floor assemblies having not less than a 1-hour fire-resistance rating when tested in accordance with ASTM E 119 or UL 263. Fire-resistance-rated floor/ceiling and wall assemblies shall extend to and be tight against the exterior wall, and wall assemblies shall extend from the foundation to the underside of the roof sheathing. 1.A fire-resistance rating of 1/2 hour shall be permitted in buildings equipped throughout with an automatic sprinkler system installed in accordance with NFPA 13. 2.Wall assemblies need not extend through attic spaces when the ceiling is protected by not less than 5/8-inch (15.9 mm) Type X gypsum board and an attic draft stop constructed as specified in Section R302.12.1 is provided above and along the wall assembly separating the dwellings. The structural framing supporting the ceiling shall also be protected by not less than 1/2-inch (12.7 mm) gypsum board or equivalent. When floor assemblies are required to be fire-resistance rated by Section R302.3, the supporting construction of such assemblies shall have an equal or greater fire-resistance rating. Two-family dwellings constructed in accordance with Section R302.3 shall comply with the sound transmission requirements of Appendix K.
Penetrations of wall or floor/ceiling assemblies required to be fire-resistance rated in accordance with Section R302.2 or R302.3 shall be protected in accordance with this section. Through penetrations of fire-resistance-rated wall or floor assemblies shall comply with Section R302.4.1.1 or R302.4.1.2. 1.2.The area of the opening through the wall does not exceed 144 square inches (92 900 mm2). 2.The material used to fill the annular space shall prevent the passage of flame and hot gases sufficient to ignite cotton waste where subjected to ASTM E 119 or UL 263 time temperature fire conditions under a minimum positive pressure differential of 0.01 inch of water (3 Pa) at the location of the penetration for the time period equivalent to the fire-resistance rating of the construction penetrated. Penetrations shall be installed as tested in the approved fire-resistance-rated assembly. Penetrations shall be protected by an approved penetration firestop system installed as tested in accordance with ASTM E 814 or UL 1479, with a minimum positive pressure differential of 0.01 inch of water (3 Pa) and shall have an F rating of not less than the required fire-resistance rating of the wall or floor/ceiling assembly penetrated. Membrane penetrations shall comply with Section R302.4.1. Where walls are required to have a fire-resistance rating, recessed fixtures shall be installed so that the required fire-resistance rating will not be reduced. 1.5.By other listed materials and methods. 2.4.By other listed materials and methods. 3.The annular space created by the penetration of a fire sprinkler provided it is covered by a metal escutcheon plate. Openings and penetrations through the walls or ceilings separating the dwelling from the garage shall be in accordance with Sections R302.5.1 through R302.5.3. Openings from a private garage directly into a room used for sleeping purposes shall not be permitted. Other openings between the garage and residence shall be equipped with solid wood doors not less than 13/8 inches (35 mm) in thickness, solid or honeycomb-core steel doors not less than 13/8 inches (35 mm) thick, or 20-minute fire-rated doors. Ducts in the garage and ducts penetrating the walls or ceilings separating the dwelling from the garage shall be constructed of a minimum No. 26 gage (0.48 mm) sheet steel or other approved material and shall have no openings into the garage. Penetrations through the separation required in Section R302.6 shall be protected as required by Section R302.11, Item 4. The garage shall be separated as required by Table R302.6. Openings in garage walls shall comply with section R302.5. From the residence and attics Not less than 1/2-inch gypsum board or equivalent applied to the garage side. Vertical separation between the garage and the residence attic shall extend to the roof sheathing or rafter blocking. From all habitable rooms above the garage Not less than 5/8-inch type X gypsum board or equivalent. Structural members supporting floor/ ceiling assemblies or garage ceiling usedfor separation required by this section Not less than 1/2-inch gypsum board or equivalent applied to the garage side of structural members supporting the floor/ceiling assemblies or garage ceiling. Structural members include,but are not limited to: walls, columns, beams, girders, and trusses. Garages located less than 3 feet from a dwelling unit on the same lot Not less than 1/2-inch gypsum board or equivalent applied to the interior side of exterior walls that are within this area. This provision does not apply togarage walls that are perpendicular to the adjacent dwelling unit wall. Enclosed accessible space under stairs shall have walls, under-stair surface and any soffits protected on the enclosed side with 1/2-inch (12.7 mm) gypsum board. For requirements for foam plastics see Section R316. R302.9Flame spread index and smoke-developed index for wall and ceiling finishes. Flame spread and smoke index for wall and ceiling finishes shall be in accordance with Sections R302.9.1 through R302.9.4. Wall and ceiling finishes shall have a flame spread index of not greater than 200. Exception: Flame spread index requirements for finishes shall not apply to trim defined as picture molds, chair rails, baseboards and handrails; to doors and windows or their frames; or to materials that are less than 1/28 inch (0.91 mm) in thickness cemented to the surface of walls or ceilings if these materials exhibit flame spread index values no greater than those of paper of this thickness cemented to a noncombustible backing. Wall and ceiling finishes shall have a smoke-developed index of not greater than 450. Tests shall be made in accordance with ASTM E 84 or UL 723. 1.During the 40 kW exposure, flames shall not spread to the ceiling. 2.The flame shall not spread to the outer extremity of the sample on any wall or ceiling. 3.Flashover, as defined in NFPA 286, shall not occur. 4.The peak heat release rate throughout the test shall not exceed 800 kW. 5.The total smoke released throughout the test shall not exceed 1,000 m2. R302.10Flame spread index and smoke-developed index for insulation. Flame spread and smoke-developed index for insulation shall be in accordance with Sections R302.10.1 through R302.10.5. Insulation materials, including facings, such as vapor retarders and vapor-permeable membranes installed within floor/ceiling assemblies, roof/ceiling assemblies, wall assemblies, crawl spaces and attics shall have a flame spread index not to exceed 25 with an accompanying smoke-developed index not to exceed 450 when tested in accordance with ASTM E 84 or UL 723. 1.When such materials are installed in concealed spaces, the flame spread index and smoke-developed index limitations do not apply to the facings, provided that the facing is installed in substantial contact with the unexposed surface of the ceiling, floor or wall finish. 2.Cellulose loose-fill insulation, which is not spray applied, complying with the requirements of Section R302.10.3, shall only be required to meet the smoke-developed index of not more than 450. 3.Foam plastic insulation shall comply with Section R316. Loose-fill insulation materials that cannot be mounted in the ASTM E 84 or UL 723 apparatus without a screen or artificial supports shall comply with the flame spread and smoke-developed limits of Section R302.10.1 when tested in accordance with CAN/ULC S102.2. Exception: Cellulose loose-fill insulation shall not be required to be tested in accordance with CAN/ULC S102.2, provided such insulation complies with the requirements of Section R302.10.1 and Section R302.10.3. Cellulose loose-fill insulation shall comply with CPSC 16 CFR, Parts 1209 and 1404. Each package of such insulating material shall be clearly labeled in accordance with CPSC 16 CFR, Parts 1209 and 1404. All exposed insulation materials installed on attic floors shall have a critical radiant flux not less than 0.12 watt per square centimeter. Tests for critical radiant flux shall be made in accordance with ASTM E 970. In combustible construction, fireblocking shall be provided to cut off all concealed draft openings (both vertical and horizontal) and to form an effective fire barrier between stories, and between a top story and the roof space. 1.1.Vertically at the ceiling and floor levels. 1.2.Horizontally at intervals not exceeding 10 feet (3048 mm). 2.At all interconnections between concealed vertical and horizontal spaces such as occur at soffits, drop ceilings and cove ceilings. 3.In concealed spaces between stair stringers at the top and bottom of the run. Enclosed spaces under stairs shall comply with Section R302.7. 4.At openings around vents, pipes, ducts, cables and wires at ceiling and floor level, with an approved material to resist the free passage of flame and products of combustion. The material filling this annular space shall not be required to meet the ASTM E 136 requirements. 5.For the fireblocking of chimneys and fireplaces, see Section R1003.19. 6.Fireblocking of cornices of a two-family dwelling is required at the line of dwelling unit separation. Except as provided in Section R302.11, Item 4, fireblocking shall consist of the following materials. 1.Two-inch (51 mm) nominal lumber. 2.Two thicknesses of 1-inch (25.4 mm) nominal lumber with broken lap joints. 3.One thickness of 23/32-inch (18.3 mm) wood structural panels with joints backed by 23/32-inch (18.3 mm) wood structural panels. 4.One thickness of 3/4-inch (19.1 mm) particleboard with joints backed by 3/4-inch (19.1 mm) particleboard. 5.One-half-inch (12.7 mm) gypsum board. 6.One-quarter-inch (6.4 mm) cement-based millboard. 7.Batts or blankets of mineral wool or glass fiber or other approved materials installed in such a manner as to be securely retained in place. 8.Cellulose insulation installed as tested for the specific application. R302.11.1.1Batts or blankets of mineral or glass fiber. Batts or blankets of mineral or glass fiber or other approved nonrigid materials shall be permitted for compliance with the 10-foot (3048 mm) horizontal fireblocking in walls constructed using parallel rows of studs or staggered studs. Unfaced fiberglass batt insulation used as fireblocking shall fill the entire cross section of the wall cavity to a minimum height of 16 inches (406 mm) measured vertically. When piping, conduit or similar obstructions are encountered, the insulation shall be packed tightly around the obstruction. Loose-fill insulation material shall not be used as a fireblock unless specifically tested in the form and manner intended for use to demonstrate its ability to remain in place and to retard the spread of fire and hot gases. The integrity of all fireblocks shall be maintained. 1.Ceiling is suspended under the floor framing. 2.Floor framing is constructed of truss-type open-web or perforated members. Draftstopping materials shall not be less than 1/2-inch (12.7 mm) gypsum board, 3/8-inch (9.5 mm) wood structural panels or other approved materials adequately supported. Draftopping shall be installed parallel to the floor framing members unless otherwise approved by the building official. The integrity of the draftstops shall be maintained. Combustible insulation shall be separated a minimum of 3 inches (76 mm) from recessed luminaires, fan motors and other heat-producing devices. Exception: Where heat-producing devices are listed for lesser clearances, combustible insulation complying with the listing requirements shall be separated in accordance with the conditions stipulated in the listing. Recessed luminaires installed in the building thermal envelope shall meet the requirements of Section N1102.4.4 of this code. All habitable rooms shall have an aggregate glazing area of not less than 8 percent of the floor area of such rooms. Natural ventilation shall be through windows, doors, louvers or other approved openings to the outdoor air. Such openings shall be provided with ready access or shall otherwise be readily controllable by the building occupants. The minimum openable area to the outdoors shall be 4 percent of the floor area being ventilated. 1.The glazed areas need not be openable where the opening is not required by Section R310 and a whole-house mechanical ventilation system is installed in accordance with Section M1507. 2.The glazed areas need not be installed in rooms where Exception 1 above is satisfied and artificial light is provided capable of producing an average illumination of 6 footcandles (65 lux) over the area of the room at a height of 30 inches (762 mm) above the floor level. 3.Use of sunroom and patio covers, as defined in Section R202, shall be permitted for natural ventilation if in excess of 40 percent of the exterior sunroom walls are open, or are enclosed only by insect screening. For the purpose of determining light and ventilation requirements, any room shall be considered as a portion of an adjoining room when at least one-half of the area of the common wall is open and unobstructed and provides an opening of not less than one-tenth of the floor area of the interior room but not less than 25 square feet (2.3 m2). Exception: Openings required for light and/or ventilation shall be permitted to open into a sunroom with thermal isolation or a patio cover, provided that there is an openable area between the adjoining room and the sunroom or patio cover of not less than one-tenth of the floor area of the interior room but not less than 20 square feet (2 m2). The minimum openable area to the outdoors shall be based upon the total floor area being ventilated. Bathrooms, water closet compartments and other similar rooms shall be provided with aggregate glazing area in windows of not less than 3 square feet (0.3 m2), one-half of which must be openable. Exception: The glazed areas shall not be required where artificial light and a local exhaust system are provided. The minimum local exhaust rates shall be determined in accordance with Section M1507. Exhaust air from the space shall be exhausted directly to the outdoors. Where the air infiltration rate of a dwelling unit is less than 5 air changes per hour when tested with a blower door at a pressure of 0.2 inch w.c (50 Pa) in accordance with Section N1102.4.1.2, the dwelling unit shall be provided with whole-house mechanical ventilation in accordance with Section M1507.3. Outdoor intake and exhaust openings shall be located in accordance with Sections R303.5.1 and R303.5.2. Mechanical and gravity outdoor air intake openings shall be located a minimum of 10 feet (3048 mm) from any hazardous or noxious contaminant, such as vents, chimneys, plumbing vents, streets, alleys, parking lots and loading docks, except as otherwise specified in this code. Where a source of contaminant is located within 10 feet (3048 mm) of an intake opening, such opening shall be located a minimum of 3 feet (914 mm) below the contaminant source. For the purpose of this section, the exhaust from dwelling unit toilet rooms, bathrooms and kitchens shall not be considered as hazardous or noxious. Exhaust air shall not be directed onto walkways. Air exhaust and intake openings that terminate outdoors shall be protected with corrosion-resistant screens, louvers or grilles having a minimum opening size of 1/4 inch (6 mm) and a maximum opening size of 1/2 inch (13 mm), in any dimension. Openings shall be protected against local weather conditions. Outdoor air exhaust and intake openings shall meet the provisions for exterior wall opening protectives in accordance with this code. All interior and exterior stairways shall be provided with a means to illuminate the stairs, including the landings and treads. Interior stairways shall be provided with an artificial light source located in the immediate vicinity of each landing of the stairway. For interior stairs the artificial light sources shall be capable of illuminating treads and landings to levels not less than 1 foot-candle (11 lux) measured at the center of treads and landings. Exterior stairways shall be provided with an artificial light source located in the immediate vicinity of the top landing of the stairway. Exterior stairways providing access to a basement from the outside grade level shall be provided with an artificial light source located in the immediate vicinity of the bottom landing of the stairway. Exception: An artificial light source is not required at the top and bottom landing, provided an artificial light source is located directly over each stairway section. Where lighting outlets are installed in interior stairways, there shall be a wall switch at each floor level to control the lighting outlet where the stairway has six or more risers. The illumination of exterior stairways shall be controlled from inside the dwelling unit. Exception: Lights that are continuously illuminated or automatically controlled. Required glazed openings shall open directly onto a street or public alley, or a yard or court located on the same lot as the building. 1.Required glazed openings may face into a roofed porch where the porch abuts a street, yard or court and the longer side of the porch is at least 65 percent unobstructed and the ceiling height is not less than 7 feet (2134 mm). 2.Eave projections shall not be considered as obstructing the clear open space of a yard or court. 3.Required glazed openings may face into the area under a deck, balcony, bay or floor cantilever provided a clear vertical space at least 36 inches (914 mm) in height is provided. Required glazed openings shall be permitted to open into sunroom additions or patio covers that abut a street, yard or court if in excess of 40 percent of the exterior sunroom walls are open, or are enclosed only by insect screening, and the ceiling height of the sunroom is not less than 7 feet (2134 mm). When the winter design temperature in Table R301.2(1) is below 60°F (16°C), every dwelling unit shall be provided with heating facilities capable of maintaining a minimum room temperature of 68°F (20°C) at a point 3 feet (914 mm) above the floor and 2 feet (610 mm) from exterior walls in all habitable rooms at the design temperature. The installation of one or more portable space heaters shall not be used to achieve compliance with this section. Every dwelling unit shall have at least one habitable room that shall have not less than 120 square feet (11 m2) of gross floor area. Other habitable rooms shall have a floor area of not less than 70 square feet (6.5 m2). Habitable rooms shall not be less than 7 feet (2134 mm) in any horizontal dimension. R304.4Height effect on room area. Portions of a room with a sloping ceiling measuring less than 5 feet (1524 mm) or a furred ceiling measuring less than 7 feet (2134 mm) from the finished floor to the finished ceiling shall not be considered as contributing to the minimum required habitable area for that room. Habitable space, hallways, bathrooms, toilet rooms, laundry rooms, and portions of basements containing these spaces shall have a ceiling height of not less than 7 feet (2134 mm). The required height shall be measured from the finish floor to the lowest projection from the ceiling. 1.For rooms with sloped ceilings, at least 50 percent of the required floor area of the room shall have a ceiling height of at least 7 feet (2134 mm) and no portion of the required floor area may have a ceiling height of less than 5 feet (1524 mm). 2.Bathrooms shall have a minimum ceiling height of 6 feet 8 inches (2032 mm) at the center of the front clearance area for water closets, bidets, or sinks. The ceiling height above fixtures shall be such that the fixture is capable of being used for its intended purpose. A shower or tub equipped with a showerhead shall have a minimum ceiling height of 6 feet 8 inches (2032 mm) above a minimum area 30 inches (762 mm) by 30 inches (762 mm) at the showerhead. Portions of basements that do not contain habitable space, hallways, bathrooms, toilet rooms, and laundry rooms shall have a ceiling height of not less than 6 feet 8 inches (2032 mm). Exception: Beams, girders, ducts, or other obstructions may project to within 6 feet 4 inches (1931 mm) of the finished floor. R305.2Alterations to existing building basements. Alterations to portions of existing basements shall comply with the provisions of this section. R305.2.1Minimum ceiling height, existing buildings. Alterations to existing basements or portions thereof shall have a ceiling height of not less than 6 feet 4 inches (1931 mm), including beams, girders, ducts, or other obstructions. Bathrooms shall have a minimum ceiling height of 6 feet 4 inches (1931 mm) at the center of the front clearance area for water closets, bidets, or sinks. A shower or tub equipped with a showerhead shall have a minimum ceiling height of 6 feet 4 inches (1931 mm) above a minimum area 30 inches (762 mm) by 30 inches (762 mm) at the wall where the showerhead is placed. The ceiling may have slopes or soffits that do not infringe on the height required for the plumbing fixture. R305.2.2Minimum stairway headroom, existing buildings. Alterations to existing basement stairways shall have a minimum headroom in all parts of the stairway not less than 6 feet 4 inches (1931 mm) measured vertically from the sloped line adjoining the tread nosing or from the floor surface of the landing or platform on that portion of the stairway. Exception: Where the nosings of treads at the side of a flight extend under the edge of a floor opening through which the stair passes, the floor opening shall be allowed to project horizontally into the required headroom a maximum of 43/4 inches (121 mm). Every dwelling unit shall be provided with a water closet, lavatory, and a bathtub or shower. Each dwelling unit shall be provided with a kitchen area and every kitchen area shall be provided with a sink. All plumbing fixtures shall be connected to a sanitary sewer or to an approved private sewage disposal system. All plumbing fixtures shall be connected to an approved water supply. Kitchen sinks, lavatories, bathtubs, showers, bidets, laundry tubs and washing machine outlets shall be provided with hot and cold water. Plumbing fixtures shall be installed in accordance with Minnesota Rules, Chapter 4715, Minnesota Plumbing Code. Bathtub and shower floors and walls above bathtubs with installed shower heads and in shower compartments shall be finished with a nonabsorbent surface. Such wall surfaces shall extend to a height of not less than 6 feet (1829 mm) above the floor. Except as indicated in Section R308.1.1 each pane of glazing installed in hazardous locations as defined in Section R308.4 shall be provided with a manufacturer’s designation specifying who applied the designation, designating the type of glass and the safety glazing standard with which it complies, which is visible in the final installation. The designation shall be acid etched, sandblasted, ceramic-fired, laser etched, embossed, or be of a type which once applied cannot be removed without being destroyed. A label shall be permitted in lieu of the manufacturer’s designation. 1.For other than tempered glass, manufacturer’s designations are not required provided the building official approves the use of a certificate, affidavit or other evidence confirming compliance with this code. 2.Tempered spandrel glass is permitted to be identified by the manufacturer with a removable paper designation. Multipane assemblies having individual panes not exceeding 1 square foot (0.09 m2) in exposed area shall have at least one pane in the assembly identified in accordance with Section R308.1. All other panes in the assembly shall be labeled “CPSC 16 CFR 1201” or “ANSI Z97.1” as appropriate. Regular, float, wired or patterned glass in jalousies and louvered windows shall be no thinner than nominal 3/16 inch (5 mm) and no longer than 48 inches (1219 mm). Exposed glass edges shall be smooth. Wired glass with wire exposed on longitudinal edges shall not be used in jalousies or louvered windows. Individual glazed areas, including glass mirrors in hazardous locations such as those indicated as defined in Section R308.4, shall pass the test requirements of Section R308.3.1. 1.Louvered windows and jalousies shall comply with Section R308.2. 2.Mirrors and other glass panels mounted or hung on a surface that provides a continuous backing support. 3.Glass unit masonry complying with Section R610. Where required by other sections of the code, glazing shall be tested in accordance with CPSC 16 CFR 1201. Glazing shall comply with the test criteria for Category II unless otherwise indicated in Table R308.3.1(1). Exception: Glazing not in doors or enclosures for hot tubs, whirlpools, saunas, steam rooms, bathtubs and showers shall be permitted to be tested in accordance with ANSI Z97.1. Glazing shall comply with the test criteria for Class A unless indicated in Table R308.3.1 (2). a.Use is permitted only by the exception to Section R308.3.1. The locations specified in Sections R308.4.1 through R308.4.7 shall be considered specific hazardous locations for the purposes of glazing. Glazing in all fixed and operable panels of swinging, sliding and bifold doors shall be considered a hazardous location. 1.Glazed openings of a size through which a 3-inch-diameter (76 mm) sphere is unable to pass. Glazing in an individual fixed or operable panel adjacent to a door where the nearest vertical edge of the glazing is within a 24-inch (610 mm) arc of either vertical edge of the door in a closed position and where the bottom exposed edge of the glazing is less than 60 inches (1524 mm) above the floor or walking surface shall be considered a hazardous location. 2.When there is an intervening wall or other permanent barrier between the door and the glazing. 3.Glazing in walls on the latch side of and perpendicular to the plane of the door in a closed position. 4.Where access through the door is to a closet or storage area 3 feet (914 mm) or less in depth. Glazing in this application shall comply with section R308.4.3. 5.Glazing that is adjacent to the fixed panel of patio doors. 4.One or more walking surfaces are within 36 inches (914 mm), measured horizontally and in a straight line, of the glazing. 2.When a horizontal rail is installed on the accessible side(s) of the glazing 34 to 38 inches (864 to 965 mm) above the walking surface. The rail shall be capable of withstanding a horizontal load of 50 pounds per linear foot (730 N/m) without contacting the glass and be a minimum of 11/2 inches (38 mm) in cross sectional height. 3.Outboard panes in insulating glass units and other multiple glazed panels when the bottom edge of the glass is 25 feet (7620 mm) or more above grade, a roof, walking surfaces or other horizontal [within 45 degrees (0.79 rad) of horizontal] surface adjacent to the glass exterior. R308.4.4Glazing in guards and railings. Glazing in guards and railings, including structural baluster panels and nonstructural in-fill panels, regardless of area or height above a walking surface shall be considered a hazardous location. Glazing in walls, enclosures or fences containing or facing hot tubs, spas, whirlpools, saunas, steam rooms, bathtubs, showers and indoor or outdoor swimming pools where the bottom exposed edge of the glazing is less than 60 inches (1524 mm) measured vertically above any standing or walking surface shall be considered a hazardous location. This shall apply to single glazing and all panes in multiple glazing. Exception: Glazing that is more than 60 inches (1524 mm), measured horizontally and in a straight line, from the water’s edge of a bathtub, hot tub, spa, whirlpool, or swimming pool. R308.4.6Glazing adjacent stairs and ramps. Glazing where the bottom exposed edge of the glazing is less than 36 inches (914 mm) above the plane of the adjacent walking surface of stairways, landings between flights of stairs and ramps shall be considered a hazardous location. 1.When a rail is installed on the accessible side(s) of the glazing 34 to 38 inches (864 to 965 mm) above the walking surface.The rail shall be capable of withstanding a horizontal load of 50 pounds per linear foot (730 N/m) without contacting the glass and be a minimum of 11/2 inches (38 mm) in cross sectional height. 2.Glazing 36 inches (914 mm) or more measured horizontally from the walking surface. R308.4.7Glazing adjacent to the bottom stair landing. Glazing adjacent to the landing at the bottom of a stairway where the glazing is less than 36 inches (914 mm) above the landing and within 60 inches (1524 mm) horizontally of the bottom tread shall be considered a hazardous location. Exception: The glazing is protected by a guard complying with Section R312 and the plane of the glass is more than 18 inches (457 mm) from the guard. Site built windows shall comply with Section 2404 of the International Building Code. Skylights and sloped glazing shall comply with the following sections. SKYLIGHT, UNIT. A factory assembled, glazed fenestration unit, containing one panel of glazing material, that allows for natural daylighting through an opening in the roof assembly while preserving the weather-resistant barrier of the roof. SKYLIGHTS AND SLOPED GLAZING. Glass or other transparent or translucent glazing material installed at a slope of 15 degrees (0.26 rad) or more from vertical. Glazing materials in skylights, including unit skylights, tubular daylighting devices, solariums, sunrooms, roofs and sloped walls are included in this definition. TUBULAR DAYLIGHTING DEVICE (TDD). A nonoperable fenestration unit primarily designed to transmit daylight from a roof surface to an interior ceiling via a tubular conduit. The basic unit consists of an exterior glazed weathering surface, a light-transmitting tube with a reflective interior surface, and an interior-sealing device such as a translucent ceiling panel. The unit may be factory assembled, or field assembled from a manufactured kit. 1.Laminated glass with a minimum 0.015-inch (0.38 mm) polyvinyl butyral interlayer for glass panes 16 square feet (1.5 m2) or less in area located such that the highest point of the glass is not more than 12 feet (3658 mm) above a walking surface or other accessible area; for higher or larger sizes, the minimum interlayer thickness shall be 0.030 inch (0.76 mm). For fully tempered or heat-strengthened glass, a retaining screen meeting the requirements of Section R308.6.7 shall be installed below the glass, except for fully tempered glass that meets either condition listed in Section R308.6.5. When the inboard pane is fully tempered, heat-strengthened or wired glass, a retaining screen meeting the requirements of Section R308.6.7 shall be installed below the glass, except for either condition listed in Section R308.6.5. All other panes in the multiple glazing may be of any type listed in Section R308.6.2. 1.Glass area 16 square feet (1.49 m2) or less. Highest point of glass not more than 12 feet (3658 mm) above a walking surface or other accessible area, nominal glass thickness not more than 3/16 inch (4.8 mm), and (for multiple glazing only) the other pane or panes fully tempered, laminated or wired glass. 2.Glass area greater than 16 square feet (1.49 m2). Glass sloped 30 degrees (0.52 rad) or less from vertical, and highest point of glass not more than 10 feet (3048 mm) above a walking surface or other accessible area. Any glazing material is permitted to be installed without screening in the sloped areas of greenhouses, provided the greenhouse height at the ridge does not exceed 20 feet (6096 mm) above grade. The screen and its fastenings shall be capable of supporting twice the weight of the glazing, be firmly and substantially fastened to the framing members, and have a mesh opening of no more than 1 inch by 1 inch (25 mm by 25 mm). 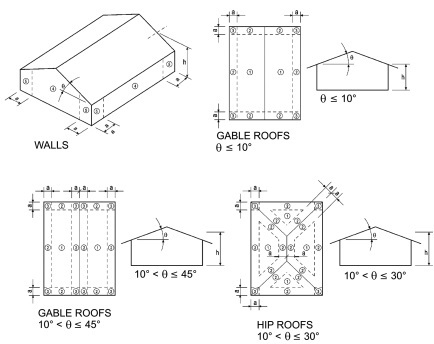 All unit skylights installed in a roof with a pitch flatter than three units vertical in 12 units horizontal (25-percent slope) shall be mounted on a curb extending at least 4 inches (102 mm) above the plane of the roof unless otherwise specified in the manufacturer’s installation instructions. Unit skylights and tubular daylighting devices shall be tested by an approved independent laboratory, and bear a label identifying manufacturer, performance grade rating and approved inspection agency to indicate compliance with the requirements of AAMA/WDMA/CSA 101/I.S.2/A440. Garage floor surfaces may be concrete, asphalt, sand, gravel, crushed rock, or natural earth. Carports shall be open on at least two sides. Carport floor surfaces may be concrete, asphalt, sand, gravel, crushed rock, or natural earth. Carports not open on at least two sides shall be considered a garage and shall comply with the provisions of this section for garages. R309.4Automatic garage door opening systems. All automatic garage door opening systems that are installed, serviced, or repaired for garages serving residential buildings shall comply with the provisions of Minnesota Statutes, Sections 325F.82 and 325F.83. Attached garages of two-family dwellings and townhouses shall be protected by fire sprinklers and installed in compliance with Section R313.3. R310.1Emergency escape and rescue required. Basements, habitable attics, and every sleeping room shall have at least one operable emergency escape and rescue opening. Where basements contain one or more sleeping rooms, emergency egress and rescue openings shall be required in each sleeping room, but not be required in adjoining areas of the basement. Where emergency escape and rescue openings are provided they shall have a sill height of not more than 44 inches (1118 mm) measured from the finished floor to the bottom of the clear opening. Where a door opening having a threshold below the adjacent ground elevation serves as an emergency escape and rescue opening and is provided with a bulkhead enclosure, the bulkhead enclosure shall comply with Section R310.3. The net clear opening dimensions required by this section shall be obtained by the normal operation of the emergency escape and rescue opening from the inside. Emergency escape and rescue openings with a finished sill height below the adjacent ground elevation shall be provided with a window well in accordance with Section R310.2. Emergency escape and rescue openings shall open directly into a public way, or to a yard or court that opens to a public way. 1.Basements used only to house mechanical equipment and not exceeding total floor area of 200 square feet (18.58 m2). 2.Basements or basement bedrooms when the building is protected with an automatic sprinkler system installed in accordance with IRC Section P2904 or NFPA 13D. C.The entire basement area, when all portions of the means of egress to the level of exit discharge, and all areas on the level of exit discharge that are open to the means of egress is protected with an automatic sprinkler system in accordance with IRC Section P2904 or NFPA 13D. Emergency escape and rescue openings shall be operational from the inside of the room without the use of keys, tools, or special knowledge. Exception: Windows with approved window opening control devices and installed in accordance with ASTM F 2090. The devices shall not require the use of keys or tools to operate. Replacement windows installed in buildings regulated by the International Residential Code shall be exempt from the maximum sill height requirements of Section R310.1, including Subsections R310.1.1, R310.1.2, and R310.1.3, if the replacement window is the manufacturer's largest standard size window that will fit within the existing frame or existing rough opening. The replacement window shall be the same operating style as the existing window or a style that provides for an equal or greater window opening area than the existing window. 4.Maximum of 48 inches (1219 mm) from the floor to the sill height. The minimum horizontal area of the window well shall be 9 square feet (0.9 m2), with a minimum horizontal projection and width of 36 inches (914 mm). The area of the window well shall allow the emergency escape and rescue opening to be fully opened. Exception: The ladder or steps required by Section R310.2.1 shall be permitted to encroach a maximum of 6 inches (152 mm) into the required dimensions of the window well. Exception: A drainage system for window wells is not required when the foundation is on well-drained soil or sand-gravel mixture soils according to the United Soil Classification System, Group I Soils, as detailed in Table R405.1. R310.4Bars, grilles, covers and screens. Bars, grilles, covers, screens or similar devices are permitted to be placed over emergency escape and rescue openings, bulkhead enclosures, or window wells that serve such openings, provided the minimum net clear opening size complies with Sections R310.1.1 to R310.1.3, and such devices shall be releasable or removable from the inside without the use of a key, tool, special knowledge or force greater than that which is required for normal operation of the escape and rescue opening. R310.5Emergency escape windows under decks and porches. All dwellings shall be provided with a means of egress as provided in this section. The means of egress shall provide a continuous and unobstructed path of vertical and horizontal egress travel from all portions of the dwelling to the exterior of the dwelling at the required egress door without requiring travel through a garage. At least one egress door shall be provided for each dwelling unit. The egress door shall be side-hinged, and shall provide a minimum clear width of 32 inches (813 mm) when measured between the face of the door and the stop, with the door open 90 degrees (1.57 rad). The minimum clear height of the door opening shall not be less than 78 inches (1981 mm) in height measured from the top of the threshold to the bottom of the stop. Other doors shall not be required to comply with these minimum dimensions. Egress doors shall be readily openable from inside the dwelling without the use of a key or special knowledge or effort. R311.3Floors and landings at exterior doors. There shall be a landing or floor on each side of each exterior door. The width of each landing shall not be less than the door served. Every landing shall have a minimum dimension of 36 inches (914 mm) measured in the direction of travel. Exterior landings shall be permitted to have a slope not to exceed 1/4 unit vertical in 12 units horizontal (2-percent). Exception: Exterior balconies less than 60 square feet (5.6 m2) and only accessible from a door are permitted to have a landing less than 36 inches (914 mm) measured in the direction of travel. R311.3.1Floor elevations at the required egress doors. Landings or finished floors at the required egress door shall not be more than 11/2 inches (38 mm) lower than the top of the threshold. Exception: The landing or floor on the exterior side shall not be more than 73/4 inches (196 mm) below the top of the threshold provided the door does not swing over the landing or floor. Where exterior landings or floors serving the required egress door are not at grade, they shall be provided with access to grade by means of a ramp in accordance with Section R311.8 or a stairway in accordance with Section R311.7. R311.3.2Floor elevations for other exterior doors. Doors other than the required egress door shall be provided with landings or floors not more than 73/4 inches (196 mm) below the top of the threshold. Exception: A landing is not required if a stairway less than 30 inches (762 mm) in height is located on the exterior side of the door, provided the door does not swing over the stairway. The stairway height shall be measured vertically from the interior floor surface to the finished grade. Storm and screen doors shall be permitted to swing over all exterior stairs and landings. Egress from habitable levels including habitable attics and basements not provided with an egress door in accordance with Section R311.2 shall be by a ramp in accordance with Section R311.8 or a stairway in accordance with Section R311.7. Exterior landings, decks, balconies, stairs and similar facilities shall be positively anchored to the primary structure to resist both vertical and lateral forces or shall be designed to be self-supporting. Attachment shall not be accomplished by use of toenails or nails subject to withdrawal. The minimum width of a hallway shall be not less than 3 feet (914 mm). R311.7.1.1Stairways serving dwellings or accessory structures. All stairways serving a dwelling or accessory structure, or any part thereof, shall comply with this section. This shall include exterior stairs from a dwelling or garage to grade and those stairs serving decks, porches, balconies, sun rooms, and similar structures. 1.Stairs serving attics or crawl spaces. 2.Stairs that only provide access to plumbing, mechanical, or electrical equipment. Stairways shall not be less than 36 inches (914 mm) in clear width at all points above the permitted hand-rail height and below the required headroom height. Handrails shall not project more than 4.5 inches (114 mm) on either side of the stairway and the minimum clear width of the stairway at and below the handrail height, including treads and landings, shall not be less than 311/2 inches (787 mm) where a handrail is installed on one side and 27 inches (698 mm) where handrails are provided on both sides. Exception: The width of spiral stairways shall be in accordance with Section R311.7.9.1. The minimum headroom in all parts of the stairway shall not be less than 6 feet 8 inches (2032 mm) measured vertically from the sloped line adjoining the tread nosing or from the floor surface of the landing or platform on that portion of the stairway. 1.Where the nosings of treads at the side of a flight extend under the edge of a floor opening through which the stair passes, the floor opening shall be allowed to project horizontally into the required headroom a maximum of 43/4 inches (121 mm). 2.The minimum headroom for existing buildings shall be in accordance with Section R305.2.2. A flight of stairs shall not have a vertical rise larger than 12 feet (3658 mm) between floor levels or landings. The walkline across winder treads shall be concentric to the curved direction of travel through the turn and located 12 inches (305 mm) from the side where the winders are narrower. The 12-inch (305 mm) dimension shall be measured from the widest point of the clear stair width at the walking surface of the winder. If winders are adjacent within the flight, the point of the widest clear stair width of the adjacent winders shall be used. Stair treads and risers shall meet the requirements of this section. For the purposes of this section all dimensions and dimensioned surfaces shall be exclusive of carpets, rugs or runners. The maximum riser height shall be 73/4 inches (196 mm). The riser shall be measured vertically between leading edges of the adjacent treads. The greatest riser height within any flight of stairs shall not exceed the smallest by more than 3/8 inch (9.5 mm). Risers shall be vertical or sloped from the underside of the nosing of the tread above at an angle not more than 30 degrees (0.51 rad) from the vertical. Open risers are permitted provided that the opening between treads does not permit the passage of a 4-inch-diameter (102 mm) sphere. Exception: The opening between adjacent treads is not limited on stairs with a total rise of 30 inches (762 mm) or less. The minimum tread depth shall be 10 inches (254 mm). The tread depth shall be measured horizontally between the vertical planes of the foremost projection of adjacent treads and at a right angle to the tread’s leading edge. The greatest tread depth within any flight of stairs shall not exceed the smallest by more than 3/8 inch (9.5 mm). Winder treads shall have a minimum tread depth of 10 inches (254 mm) measured between the vertical planes of the foremost projection of adjacent treads at the intersections with the walkline. Winder treads shall have a minimum tread depth of 6 inches (152 mm) at any point within the clear width of the stair. Within any flight of stairs, the largest winder tread depth at the walkline shall not exceed the smallest winder tread by more than 3/8 inch (9.5 mm). Consistently shaped winders at the walkline shall be allowed within the same flight of stairs as rectangular treads and do not have to be within 3/8 inch (9.5 mm) of the rectangular tread depth. The radius of curvature at the nosing shall be no greater than 9/16 inch (14 mm). A nosing not less than 3/4 inch (19 mm) but not more than 11/4 inches (32 mm) shall be provided on stairways with solid risers. The greatest nosing projection shall not exceed the smallest nosing projection by more than 3/8 inch (9.5 mm) between two stories, including the nosing at the level of floors and landings. Beveling of nosings shall not exceed 1/2 inch (12.7 mm). Exception: A nosing is not required where the tread depth is a minimum of 11 inches (279 mm). R311.7.5.4Exterior wood/plastic composite stair treads. Wood/plastic composite stair treads shall comply with the provisions of Section R507.3. There shall be a floor or landing at the top and bottom of each stairway. The minimum width perpendicular to the direction of travel shall be no less than the width of the flight served. Landings of shapes other than square or rectangular shall be permitted provided the depth at the walk line and the total area is not less than that of a quarter circle with a radius equal to the required landing width. Where the stairway has a straight run, the minimum depth in the direction of travel shall be not less than 36 inches (914 mm). Exception: A floor or landing is not required at the top of an interior flight of stairs, including stairs in an enclosed garage, provided a door does not swing over the stairs. The walking surface of treads and landings of stairways shall be sloped no steeper than one unit vertical in 48 inches horizontal (2-percent slope). Handrails shall be provided on at least one side of each continuous run of treads or flight with four or more risers. Handrail height, measured vertically from the sloped plane adjoining the tread nosing, or finish surface of ramp slope, shall be not less than 34 inches (864 mm) and not more than 38 inches (965 mm). 1.The use of a volute, turnout or starting easing shall be allowed over the lowest tread. 2.When handrail fittings or bendings are used to provide continuous transition between flights, transitions at winder treads, the transition from handrail to guardrail, or used at the start of a flight, the handrail height at the fittings or bendings shall be permitted to exceed the maximum height. Handrails for stairways shall be continuous for the full length of the flight, from a point directly above the top riser of the flight to a point directly above the lowest riser of the flight. Handrail ends shall be returned or shall terminate in newel posts or safety terminals. Handrails adjacent to a wall shall have a space of not less than 11/2 inch (38 mm) between the wall and the handrails. 1.Handrails shall be permitted to be interrupted by a newel post at the turn. 2.The use of a volute, turnout, starting easing or starting newel shall be allowed over the lowest tread. All required handrails shall be of one of the following types or provide equivalent graspability. 1.Type I. Handrails with a circular cross section shall have an outside diameter of at least 11/4 inches (32 mm) and not greater than 2 inches (51 mm). If the handrail is not circular, it shall have a perimeter dimension of at least 4 inches (102 mm) and not greater than 61/4 inches (160 mm) with a maximum cross section of dimension of 21/4 inches (57 mm). Edges shall have a minimum radius of 0.01 inch (0.25 mm). 2.Type II. Handrails with a perimeter greater than 61/4 inches (160 mm) shall have a graspable finger recess area on both sides of the profile. The finger recess shall begin within a distance of 3/4 inch (19 mm) measured vertically from the tallest portion of the profile and achieve a depth of at least 5/16 inch (8 mm) within 7/8 inch (22 mm) below the widest portion of the profile. This required depth shall continue for at least 3/8 inch (10 mm) to a level that is not less than 13/4 inches (45 mm) below the tallest portion of the profile. The minimum width of the handrail above the recess shall be 11/4 inches (32 mm) to a maximum of 23/4 inches (70 mm). Edges shall have a minimum radius of 0.01 inch (0.25 mm). Wood/plastic composite handrails shall comply with the provisions of Section R507.3. All stairs shall be provided with illumination in accordance with Section R303.6. Spiral stairways and bulkhead enclosure stairways shall comply with all requirements of Section R311.7 except as specified below. Spiral stairways are permitted, provided the minimum clear width at and below the handrail shall be 26 inches (660 mm) with each tread having a 71/2-inch (190 mm) minimum tread depth at 12 inches (914 mm) from the narrower edge. All treads shall be identical, and the rise shall be no more than 91/2 inches (241 mm). A minimum headroom of 6 feet 6 inches (1982 mm) shall be provided. Stairways serving bulkhead enclosures, not part of the required building egress, providing access from the outside grade level to the basement shall be exempt from the requirements of Sections R311.3 and R311.7 where the maximum height from the basement finished floor level to grade adjacent to the stairway does not exceed 8 feet (2438 mm) and the grade level opening to the stairway is covered by a bulkhead enclosure with hinged doors or other approved means. Ramps shall have a maximum slope of 1 unit vertical in 12 units horizontal (8.3-percent slope). Exception: Where it is technically infeasible to comply because of site constraints, ramps may have a maximum slope of one unit vertical in eight horizontal (12.5-percent slope). 1.At the top and bottom of ramps. 2.Where doors open onto ramps. Handrails shall be provided on at least one side of all ramps exceeding a slope of one unit vertical in 12 units horizontal (8.33-percent slope). Handrail height, measured above the finished surface of the ramp slope, shall be not less than 34 inches (864 mm) and not more than 38 inches (965 mm). Handrails on ramps shall comply with Section R311.7.8.3. Handrails where required on ramps shall be continuous for the full length of the ramp. Handrail ends shall be returned or shall terminate in newel posts or safety terminals. Handrails adjacent to a wall shall have a space of not less than 11/2 inches (38 mm) between the wall and the handrails. Guards shall be provided in accordance with Sections R312.1.1 through R312.1.4. Guards shall be located along the open sides of floors, stairs, ramps, and landings that are located more than 30 inches (762 mm) measured vertically to the floor or grade below. Insect screening shall not be considered as a guard. Required guards at open-sided walking surfaces, including stairs, porches, balconies or landings, shall be not less than 36 inches (914 mm) high measured vertically above the adjacent walking surface, adjacent fixed seating or the line connecting the leading edges of the treads. 1.Guards on the open sides of stairs shall have a height not less than 34 inches (864 mm) measured vertically from a line connecting the leading edges of the treads. 2.Where the top of the guard also serves as a handrail on the open sides of stairs, the top of the guard shall not be less than 34 inches (864 mm) and not more than 38 inches (965 mm) measured vertically from a line connecting the leading edges of the treads. Required guards shall not have openings from the walking surface to the required guard height which allow passage of a sphere 4 inches (102 mm) in diameter. 1.The triangular openings at the open side of stair, formed by the riser, tread and bottom rail of a guard, shall not allow passage of a sphere 6 inches (153 mm) in diameter. 2.Guards on the open side of stairs shall not have openings which allow passage of a sphere 43/8 inches (111 mm) in diameter. Woodplastic composite guards shall comply with the provisions of Section R317.4. Window fall protection shall be provided in accordance with Sections R312.2.1 and R312.2.2. In dwelling units, where the lowest part of the opening of an operable window is located more than 72 inches (1829 mm) above the finished grade or surface below, the lowest part of the window opening shall be a minimum of 36 inches (914 mm) above the finished floor of the room in which the window is located. Operable sections of windows shall not permit openings that allow passage of a 4-inch diameter (102 mm) sphere where such openings are located within 36 inches (914 mm) of the finished floor. 1.Windows with openings that will not allow a 4-inch diameter (102 mm) sphere to pass through the opening when the window is in its largest opened position. 2.Openings that are provided with window fall prevention devices that comply with ASTM F 2090. 3.Windows that are provided with window opening control devices that comply with Section R312.2.2. Window opening control devices shall comply with ASTM F 2090. The window opening control device, after operation to release the control device allowing the window to fully open, shall not reduce the minimum net clear opening area of the window unit to less than the area required by Section R310.1.1. R313.1Townhouse automatic fire sprinkler systems. An automatic residential fire sprinkler system shall be installed in townhouses. 1.An automatic residential fire sprinkler system shall not be required to be installed in a two-unit townhouse, unless required by Section R313.4. 2.An automatic residential fire sprinkler system shall not be required if additions, alterations, or repairs are made to existing buildings that do not have an automatic residential sprinkler system installed. Automatic residential fire sprinkler systems for townhouses shall be designed and installed in accordance with IRC Section P2904 or NFPA 13D. R313.2One- and two-family dwellings automatic fire systems. An automatic residential fire sprinkler system shall not be required to be installed in one- and two-family dwellings, unless required by Section R313.4. Automatic residential fire sprinkler systems shall be designed and installed in accordance with IRC Section P2904 or NFPA 13D. When an automatic sprinkler system is required in two-family dwellings, it shall be installed in accordance with IRC Section P2904 or NFPA 13D. 2.Attached covered patios, covered decks, covered porches, and similar structures are required to have automatic sprinklers with a minimum of one dry head for every 20 lineal feet (6.096 m) of common wall between the dwelling unit and the covered patio, covered deck, covered porch, or similar structure. Exception: Attached roofs of covered patios, covered decks, covered porches, or similar structures that do not exceed 40 square feet (3.716 m2) of floor area. One- and two-family dwellings and townhouse buildings containing facilities required to be licensed or registered by the state of Minnesota shall be provided with an automatic sprinkler system required by the applicable licensing provisions of that agency or according to this part, whichever is more restrictive. All smoke alarms shall be listed and labeled in accordance with UL 217 and installed in accordance with the provisions of this code and the household fire warning equipment provisions of NFPA 72. Household fire alarm systems installed in accordance with NFPA 72 that include smoke alarms, or a combination of smoke detector and audible notification device installed as required by this section for smoke alarms, shall be permitted. The household fire alarm system shall provide the same level of smoke detection and alarm as required by this section for smoke alarms. Where a household fire warning system is installed using a combination of smoke detector and audible notification device(s), it shall become a permanent fixture of the occupancy and owned by the homeowner. The system shall be monitored by an approved supervising station and be maintained in accordance with NFPA 72. Exception: Where smoke alarms are provided meeting the requirements of Section R314.4. 2.Outside each separate sleeping area in the immediate vicinity of the bedrooms. 3.On each additional story of the dwelling, including basements and habitable attics but not including crawl spaces and uninhabitable attics. In dwellings or dwelling units with split levels and without an intervening door between the adjacent levels, a smoke alarm installed on the upper level shall suffice for the adjacent lower level provided that the lower level is less than one full story below the upper level. 2.One or more sleeping rooms are added or created in existing dwellings. 1.Work involving the exterior surfaces of dwellings, such as the replacement of roofing or siding, or the addition of an open porch or deck, or chimney repairs. 2.Installation, alteration, or repairs of plumbing, electrical, or mechanical systems. Smoke alarms shall receive their primary power from the building wiring when such wiring is served from a commercial source, and when primary power is interrupted, shall receive power from a battery. Wiring shall be permanent and without a disconnecting switch other than those required for overcurrent protection. 1.Smoke alarms shall be permitted to be battery operated when installed in buildings without commercial power. 2.Hard wiring of smoke alarms in existing areas shall not be required where the alterations or repairs do not result in the removal of interior wall or ceiling finishes exposing the structure, unless there is an attic, crawl space or basement available which could provide access for hard wiring without the removal of interior finishes. Where more than one smoke alarm is required to be installed within an individual dwelling unit in accordance with Section R314.3, the alarm devices shall be interconnected in such a manner that the actuation of one alarm will activate all of the alarms in the individual unit. Physical interconnection of smoke alarms shall not be required where listed wireless alarms are installed and all alarms sound upon activation of one alarm. Exception: Interconnection of smoke alarms in existing areas shall not be required where alterations or repairs do not result in removal of interior wall or ceiling finishes exposing the structure, unless there is an attic, crawl space or basement available which could provide access for interconnection without the removal of interior finishes. Carbon monoxide alarms shall be installed outside and not more than 10 feet (3048 mm) from each separate sleeping area or bedroom. Alarms shall be installed on each level containing sleeping areas or bedrooms. Carbon monoxide detection systems that include carbon monoxide detectors and audible notification appliances, installed and maintained in accordance with this section for carbon monoxide alarms and NFPA 720, shall be permitted. The carbon monoxide detectors shall be listed as complying with UL 2075. Where a household carbon monoxide detection system is installed, it shall become a permanent fixture of the occupancy, owned by the homeowner and shall be monitored by an approved supervising station. Exception: Where carbon monoxide alarms are installed meeting the requirements of Section R315.1, compliance with Section 315.2 is not required. R315.3Where required in existing dwellings. Where work requiring a permit occurs in existing dwellings that have attached garages or in existing dwellings within which fuel-fired appliances exist, carbon monoxide alarms shall be provided in accordance with Section R315.1. Single-station carbon monoxide alarms shall be listed as complying with UL 2034 and shall be installed in accordance with this code and the manufacturer’s installation instructions. The provisions of this section shall govern the materials, design, application, construction and installation of foam plastic materials. Packages and containers of foam plastic insulation and foam plastic insulation components delivered to the job site shall bear the label of an approved agency showing the manufacturer’s name, the product listing, product identification and information sufficient to determine that the end use will comply with the requirements. Unless otherwise allowed in Section R316.5 or R316.6, all foam plastic or foam plastic cores used as a component in manufactured assemblies used in building construction shall have a flame spread index of not more than 75 and shall have a smoke-developed index of not more than 450 when tested in the maximum thickness intended for use in accordance with ASTM E 84 or UL 723. Loose-fill-type foam plastic insulation shall be tested as board stock for the flame spread index and smoke-developed index. Exception: Foam plastic insulation more than 4 inches (102 mm) thick shall have a maximum flame spread index of 75 and a smoke-developed index of 450 where tested at a minimum thickness of 4 inches (102 mm), provided the end use is approved in accordance with Section R316.6 using the thickness and density intended for use. Unless otherwise allowed in Section R316.5 or Section R316.6, foam plastic shall be separated from the interior of a building by an approved thermal barrier of minimum 1/2 inch (12.7 mm) gypsum wallboard or a material that is tested in accordance with and meets the acceptance criteria of both the Temperature Transmission Fire Test and the Integrity Fire Test of NFPA 275. The following requirements shall apply to these uses of foam plastic unless specifically approved in accordance with Section R316.6 or by other sections of the code or the requirements of Sections R316.2 through R316.4 have been met. The thermal barrier specified in Section R316.4 is not required in a masonry or concrete wall, floor or roof when the foam plastic insulation is separated from the interior of the building by a minimum 1-inch (25 mm) thickness of masonry or concrete. The thermal barrier specified in Section R316.4 is not required when the foam plastic in a roof assembly or under a roof covering is installed in accordance with the code and the manufacturer’s installation instructions and is separated from the interior of the building by tongue-and-groove wood planks or wood structural panel sheathing in accordance with Section R803, not less than 15/32 inch (11.9 mm) thick bonded with exterior glue and identified as Exposure 1, with edges supported by blocking or tongue-and-groove joints or an equivalent material. The smoke-developed index for roof applications shall not be limited. 1.Attic access is required by Section R807.1. 2.The space is entered only for purposes of repairs or maintenance. 3.7.11/2-inch-thick (38 mm) cellulose insulation. The above ignition barrier is not required where the foam plastic insulation has been tested in accordance with Section R316.6. 2.Entry is made only for purposes of repairs or maintenance. 3.6.Corrosion-resistant steel having a base metal thickness of 0.016 inch (0.406 mm). Foam-filled exterior doors are exempt from the requirements of Sections R316.3 and R316.4. Foam-filled garage doors in attached or detached garages are exempt from the requirements of Sections R316.3 and R316.4. 3.The foam plastic insulation has been tested in accordance with Section R316.6. The thermal barrier specified in Section R316.4 is not required where the foam plastic insulation is installed over existing exterior wall finish in conjunction with re-siding provided the foam plastic has a maximum thickness of 0.5 inch (12.7 mm) and a potential heat of not more than 2000 Btu per square foot (22 720 kJ/m2) when tested in accordance with NFPA 259. 1.The minimum density is 20 pounds per cubic foot (320 kg/m3). 2.The maximum thickness of the trim is 0.5 inch (12.7 mm) and the maximum width is 8 inches (204 mm). 3.The interior trim shall not constitute more than 10 percent of the aggregate wall and ceiling area of any room or space. 4.The flame spread index does not exceed 75 when tested per ASTM E 84 or UL 723. The smoke-developed index is not limited. Foam plastics shall be permitted as interior finish where approved in accordance with Section R316.6 Foam plastics that are used as interior finish shall also meet the flame spread index and smoke-developed index requirements of Sections R302.9.1 and R302.9.2. 1.The maximum thickness of the foam plastic shall be 31/4 inches (83 mm). 2.The density of the foam plastic shall be in the range of 0.5 to 2.0 pounds per cubic foot (8 to 32 kg/m3). 3.The foam plastic shall have a flame spread index of 25 or less and an accompanying smoke-developed index of 450 or less when tested in accordance with ASTM E 84 or UL 723. Foam plastic insulation used as sheathing shall comply with Section R316.3 and Section R316.4. Where the foam plastic sheathing is exposed to the attic space at a gable or kneewall, the provisions of Section R316.5.3 shall apply. The thermal barrier specified in Section R316.4 is not required to be installed on the walking surface of a structural floor system that contains foam plastic insulation when the foam plastic is covered by a minimum nominal 1/2-inch-thick (12.7 mm) wood structural panel or equivalent. The thermal barrier specified in Section R316.4 is required on the underside of the structural floor system that contains foam plastic insulation when the underside of the structural floor system is exposed to the interior of the building. Foam plastic not meeting the requirements of Sections R316.3 through R316.5 shall be specifically approved on the basis of one of the following approved tests: NFPA 286 with the acceptance criteria of Section R302.9.4, FM4880, UL 1040, or UL 1715, or fire tests related to actual end-use configurations. Approval shall be based on the actual end use configuration and shall be performed on the finished foam plastic assembly in the maximum thickness intended for use. Assemblies tested shall include seams, joints and other typical details used in the installation of the assembly and shall be tested in the manner intended for use. The use of foam plastics in areas of “very heavy” termite infestation probability shall be in accordance with Section R318.4. Protection of wood and wood based products from decay shall be provided in the following locations by the use of naturally durable wood or wood that is preservative-treated in accordance with AWPA U1 for the species, product, preservative and end use. Preservatives shall be listed in Section 4 of AWPA U1. 1.Wood joists or the bottom of a wood structural floor when closer than 18 inches (457 mm) or wood girders when closer than 12 inches (305 mm) to the exposed ground in crawl spaces or unexcavated area located within the periphery of the building foundation. 2.All wood framing members that rest on concrete or masonry exterior foundation walls and are less than 8 inches (203 mm) from the exposed ground. 3.Sills and sleepers on a concrete or masonry slab that is in direct contact with the ground unless separated from such slab by an impervious moisture barrier. 4.The ends of wood girders entering exterior masonry or concrete walls having clearances of less than 1/2 inch (12.7 mm) on tops, sides and ends. 5.Wood siding, sheathing and wall framing on the exterior of a building having a clearance of less than 6 inches (152 mm) from the ground or less than 2 inches (51 mm) measured vertically from concrete steps, porch slabs, patio slabs, and similar horizontal surfaces exposed to the weather. 6.Wood structural members supporting moisture-permeable floors or roofs that are exposed to the weather, such as concrete or masonry slabs, unless separated from such floors or roofs by an impervious moisture barrier. 7.Wood furring strips or other wood framing members attached directly to the interior of exterior masonry walls or concrete walls below grade except where an approved vapor retarder is applied between the wall and the furring strips or framing members. Field-cut ends, notches and drilled holes of preservative-treated wood shall be treated in the field in accordance with AWPA M4. All wood in contact with the ground, embedded in concrete in direct contact with the ground or embedded in concrete exposed to the weather that supports permanent structures intended for human occupancy shall be approved pressure-preservative-treated wood suitable for ground contact use, except untreated wood may be used where entirely below groundwater level or continuously submerged in fresh water. 1.Horizontal members such as girders, joists and decking. 2.Vertical members such as posts, poles and columns. 3.Both horizontal and vertical members. Wood columns shall be approved wood of natural decay resistance or approved pressure-preservative-treated wood. 1.Columns exposed to the weather or in basements when supported by concrete piers or metal pedestals projecting 1 inch (25.4 mm) above a concrete floor or 6 inches (152 mm) above exposed earth and the earth is covered by an approved impervious moisture barrier. 2.Columns in enclosed crawl spaces or unexcavated areas located within the periphery of the building when supported by a concrete pier or metal pedestal at a height more than 8 inches (203 mm) from exposed earth and the earth is covered by an impervious moisture barrier. The portions of glued-laminated timbers that form the structural supports of a building or other structure and are exposed to weather and not properly protected by a roof, eave or similar covering shall be pressure treated with preservative, or be manufactured from naturally durable or preservative-treated wood. Lumber and plywood required to be pressure-preservative-treated in accordance with Section R318.1 shall bear the quality mark of an approved inspection agency that maintains continuing supervision, testing and inspection over the quality of the product and that has been approved by an accreditation body that complies with the requirements of the American Lumber Standard Committee treated wood program. 1.Identification of the treating plant. 4.End use for which the product was treated. 5.Standard to which the product was treated. 6.Identity of the approved inspection agency. 7.The designation “Dry,” if applicable. Exception: Quality marks on lumber less than 1 inch (25.4 mm) nominal thickness, or lumber less than nominal 1 inch by 5 inches (25.4 mm by 127 mm) or 2 inches by 4 inches (51 mm by 102 mm) or lumber 36 inches (914 mm) or less in length shall be applied by stamping the faces of exterior pieces or by end labeling not less than 25 percent of the pieces of a bundled unit. R317.3Fasteners and connectors in contact with preservative-treated and fire-retardant-treated wood. Fasteners, including nuts and washers, and connectors in contact with preservative-treated wood and fire-retardant-treated wood shall be in accordance with this section. The coating weights for zinc-coated fasteners shall be in accordance with ASTM A 153. Fasteners, including nuts and washers, for preservative-treated wood shall be of hot-dipped, zinc-coated galvanized steel, stainless steel, silicon bronze or copper. Coating types and weights for connectors in contact with preservative-treated wood shall be in accordance with the connector manufacturer’s recommendations. In the absence of manufacturer’s recommendations, a minimum of ASTM A 653 type G185 zinc-coated galvanized steel, or equivalent, shall be used. 1.One-half-inch-diameter (12.7 mm) or greater steel bolts. 2.Fasteners other than nails and timber rivets shall be permitted to be of mechanically deposited zinc-coated steel with coating weights in accordance with ASTM B 695, Class 55 minimum. 3.Plain carbon steel fasteners in SBX/DOT and zinc borate preservative-treated wood in an interior, dry environment shall be permitted. Fastenings, including nuts and washers, for wood foundations shall be as required in AF&PA PWF. R317.3.3Fasteners for fire-retardant-treated wood used in exterior applications or wet or damp locations. Fasteners, including nuts and washers, for fire-retardant-treated wood used in exterior applications or wet or damp locations shall be of hot-dipped, zinc-coated galvanized steel, stainless steel, silicon bronze or copper. Fasteners other than nails and timber rivets shall be permitted to be of mechanically deposited zinc-coated steel with coating weights in accordance with ASTM B 695, Class 55 minimum. R317.3.4Fasteners for fire-retardant-treated wood used in interior applications. Fasteners, including nuts and washers, for fire-retardant-treated wood used in interior locations shall be in accordance with the manufacturer’s recommendations. In the absence of the manufacturer’s recommendations, Section R317.3.3 shall apply. Wood/plastic composites used in exterior deck boards, stair treads, handrails and guardrail systems shall bear a label indicating the required performance levels and demonstrating compliance with the provisions of ASTM D 7032. Deck boards and stair treads shall bear a label that indicates compliance to ASTM D 7032 and includes the allowable load and maximum allowable span. Handrails and guardrail systems or their packaging shall bear a label that indicates compliance to ASTM D 7032 and includes the maximum allowable span. Wood/plastic composites shall be installed in accordance with the manufacturer’s instructions. 1.Chemical termiticide treatment, as provided in Section R318.2. 2.Termite baiting system installed and maintained according to the label. 3.Pressure-preservative-treated wood in accordance with the provisions of Section R317.1. 5.Physical barriers as provided in Section R318.3 and used in locations as specified in Section R317.1. 6.Cold-formed steel framing in accordance with Sections R505.2.1 and R603.2.1. Lumber and plywood required to be pressure-preservative-treated in accordance with Section R318.1 shall bear the quality mark of an approved inspection agency which maintains continuing supervision, testing and inspection over the quality of the product and which has been approved by an accreditation body which complies with the requirements of the American Lumber Standard Committee treated wood program. Field-cut ends, notches, and drilled holes of pressure-preservative-treated wood shall be retreated in the field in accordance with AWPA M4. Chemical termiticide treatment shall include soil treatment and/or field applied wood treatment. The concentration, rate of application and method of treatment of the chemical termiticide shall be in strict accordance with the termiticide label. Approved physical barriers, such as metal or plastic sheeting or collars specifically designed for termite prevention, shall be installed in a manner to prevent termites from entering the structure. Shields placed on top of an exterior foundation wall are permitted to be used only if in combination with another method of protection. In areas where the probability of termite infestation is “very heavy” as indicated in Figure R301.2(6), extruded and expanded polystyrene, polyisocyanurate and other foam plastics shall not be installed on the exterior face or under interior or exterior foundation walls or slab foundations located below grade. The clearance between foam plastics installed above grade and exposed earth shall be at least 6 inches (152 mm). 1.Buildings where the structural members of walls, floors, ceilings and roofs are entirely of noncombustible materials or pressure-preservative-treated wood. 2.When in addition to the requirements of Section R318.1, an approved method of protecting the foam plastic and structure from subterranean termite damage is used. 3.On the interior side of basement walls. Buildings shall have approved address numbers, building numbers or approved building identification placed in a position that is plainly legible and visible from the street or road fronting the property. These numbers shall contrast with their background. Address numbers shall be Arabic numbers or alphabetical letters. Numbers shall be a minimum of 4 inches (102 mm) high with a minimum stroke width of 1/2 inch (12.7 mm). Where access is by means of a private road and the building address cannot be viewed from the public way, a monument, pole or other sign or means shall be used to identify the structure.